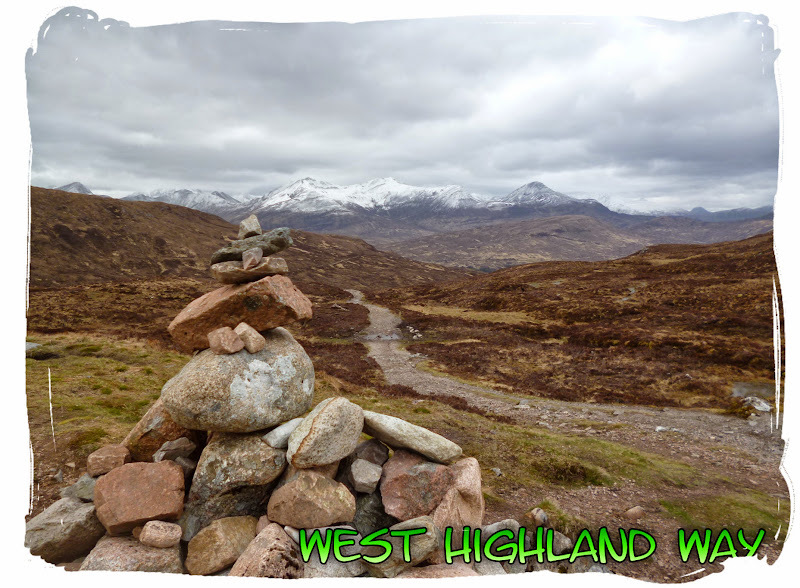 The West Highland Way is a linear long distance footpath in Scotland, with the official status of Long Distance Route. 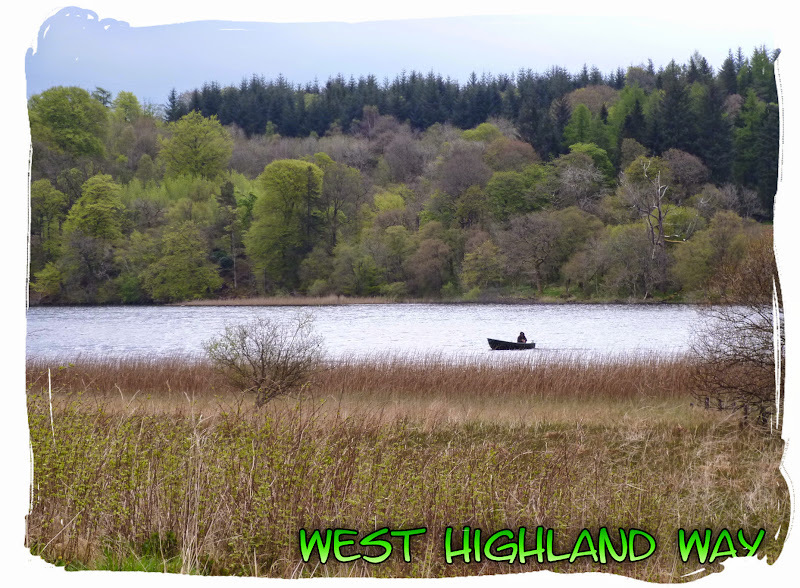 The 154Km (96miles) route starts at Milngavie (approx 7 miles north of Glasgow) and passes through Mugdock Country Park, follows the shores of Loch Lomond, passing Ben Lomond, through Glen Falloch and Strathfillan, crossing Rannoch Moor, past Buachaille Etive Mor to the head of Glencoe, climbing the Devil’s Staircase, descending to the Loch Leven before entering Lairigmor and Glen Nevis and finishes at Gordon Square in Fort William. 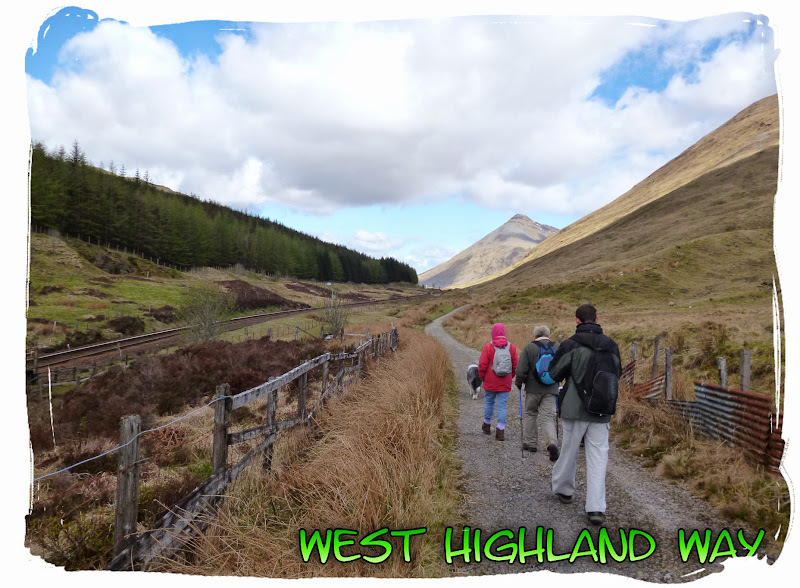 This would be my first time walking the West Highland Way. 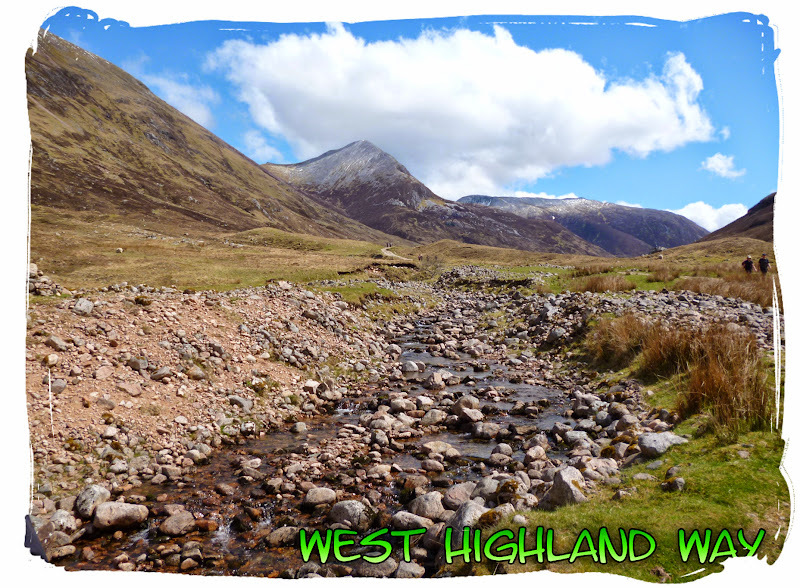 I have lived in Scotland all my life but I never really took an interest in the outdoors until 2011 after dragging myself up Ben Nevis in an effort to lose weight. 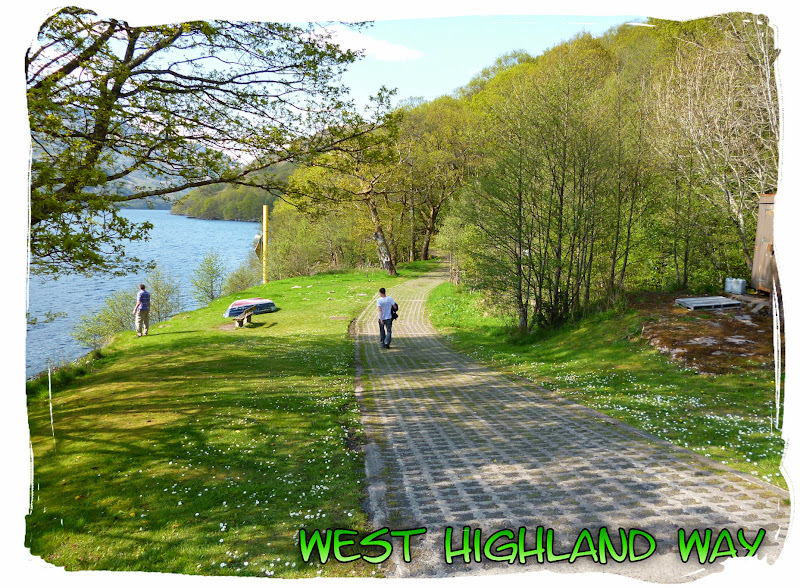 That was followed up in 2012 by walking stages of the Great Glen Way, after that there had to be a plan for 2013 and there it was. 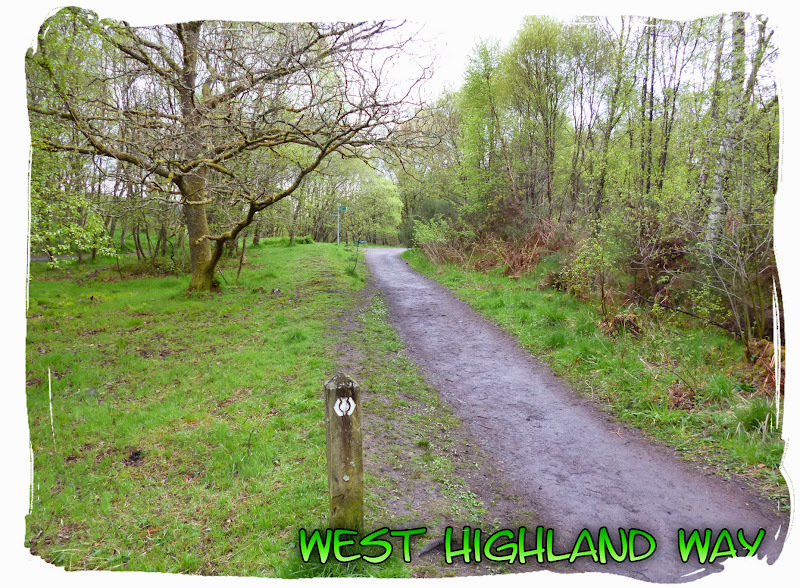 My friend and I agreed to complete West Highland Way over 7 days, we set the date for 18 May 2013 and spent the entire winter looking forward to the spring. May 17 finally arrived. 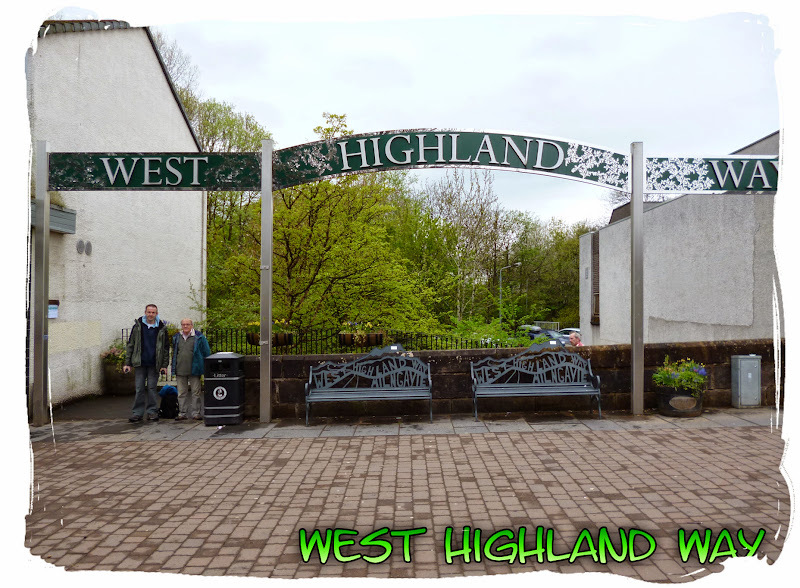 My father transported us to Milngavie on the Friday afternoon, the kind chap would act as our baggage transfer service for the week. Upon arrival in Milngavie we paid Tesco a visit before heading to Bankell Farm, 2 miles east of Milngavie where we would spend our first night before our big adventure. 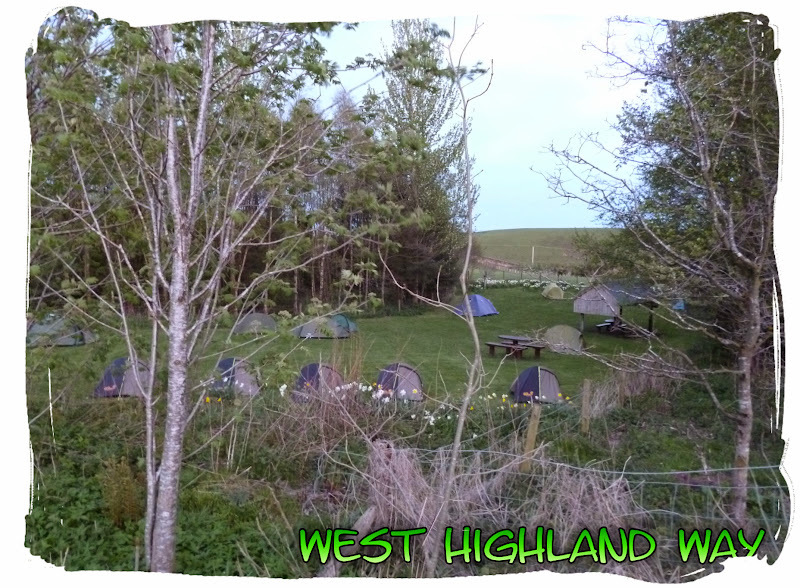 The campsite was fairly busy and fairly cheap at £6.00 per night. 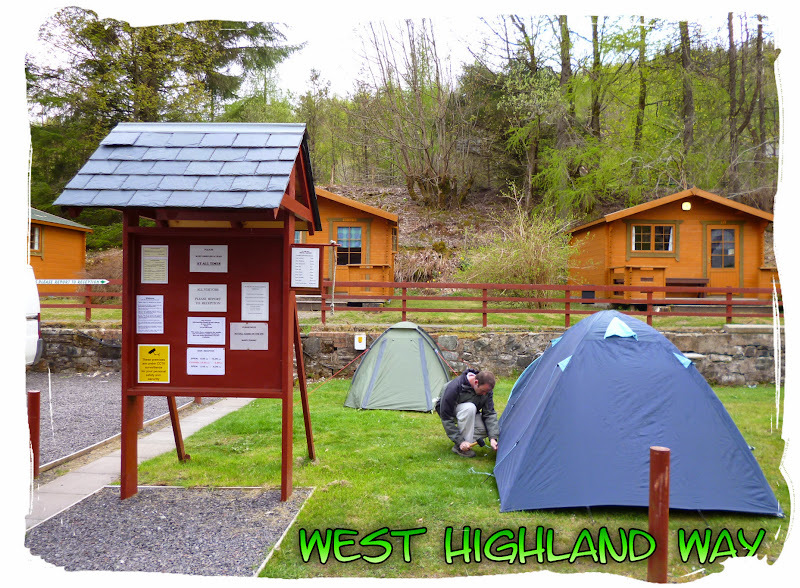 It thankfully stayed dry for the evening as we pitched our tents for the first time of the 2013 season. Then we got down to business, celebarting the start of our adventure with the first bbq of the season, washed down with some well earned Stellas. JP with his first Beer.. and certainly not his last!! 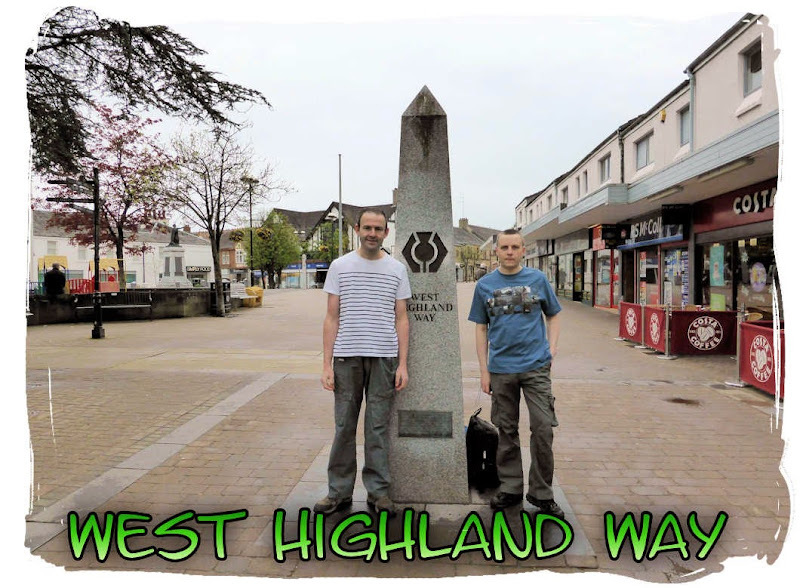 My father drove us to Milngavie Centre, where we got our picture taken stood by the obelisk, the starting point of the WHW. We popped into Costa for a quick Latte before making a move about 10am. 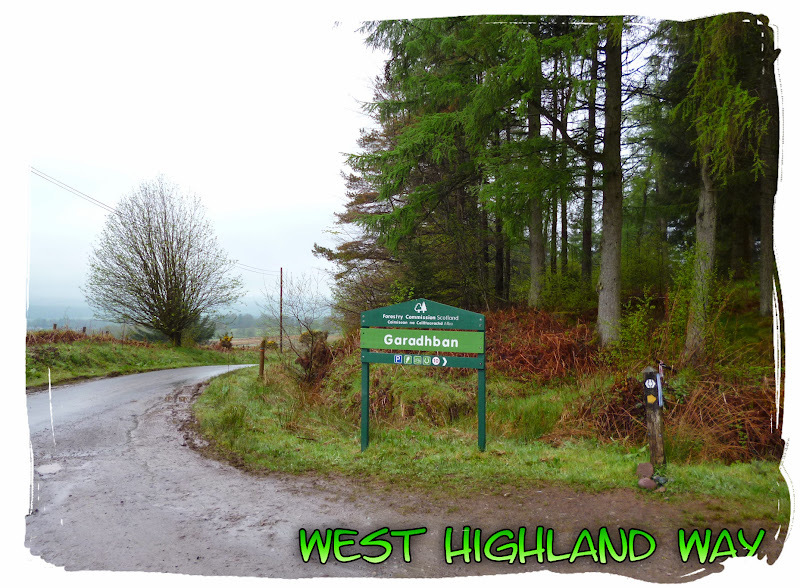 We started to make our way to Drymen, a 12 mile walk passing through Mugdock Country Park and Carbeth as the rain came on heavy. 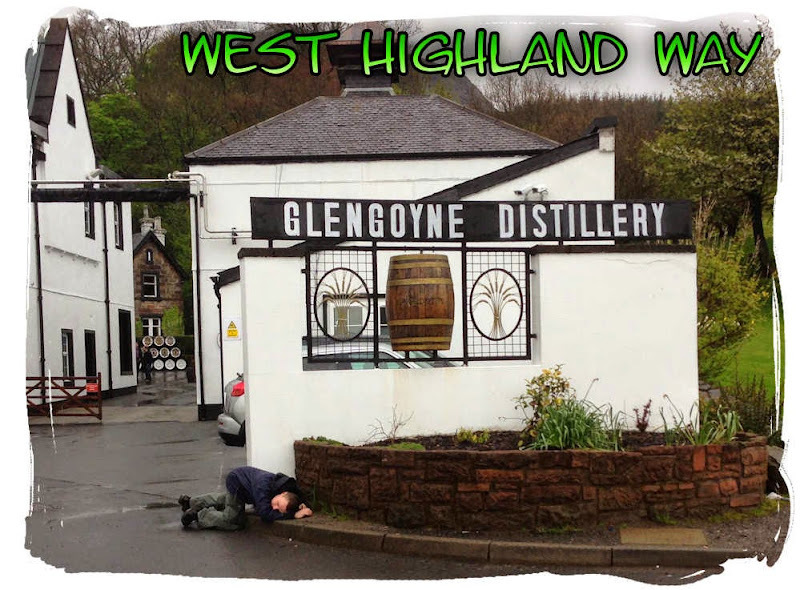 We ran for cover at the Glengoyne Distillery, taking advantage of the lower priced tour. 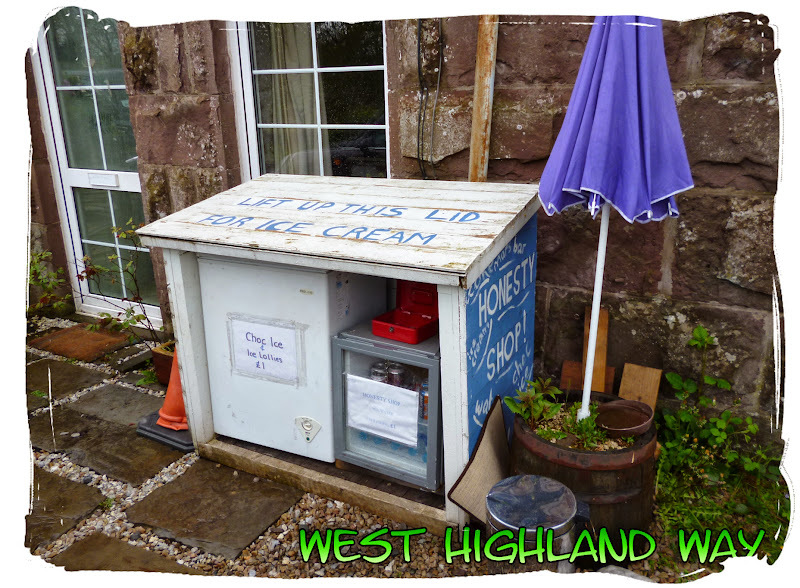 The honesty shop at Carbeth - a test of trust. perhaps one too many at the Distillery? 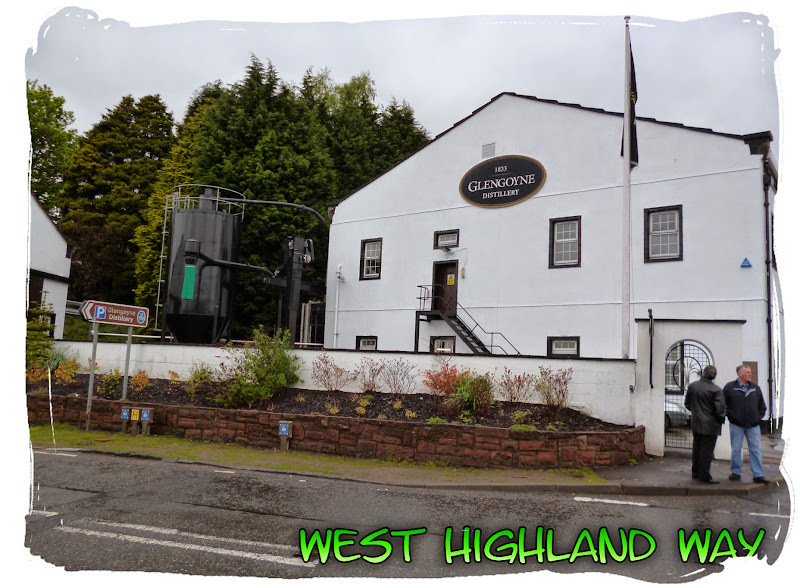 Upon reaching Drymen, we pitched up at Drumquhassle farm before taking a walk into the village, where there is a few shops, pubs and a hotel. There is also a bank with a cash machine. 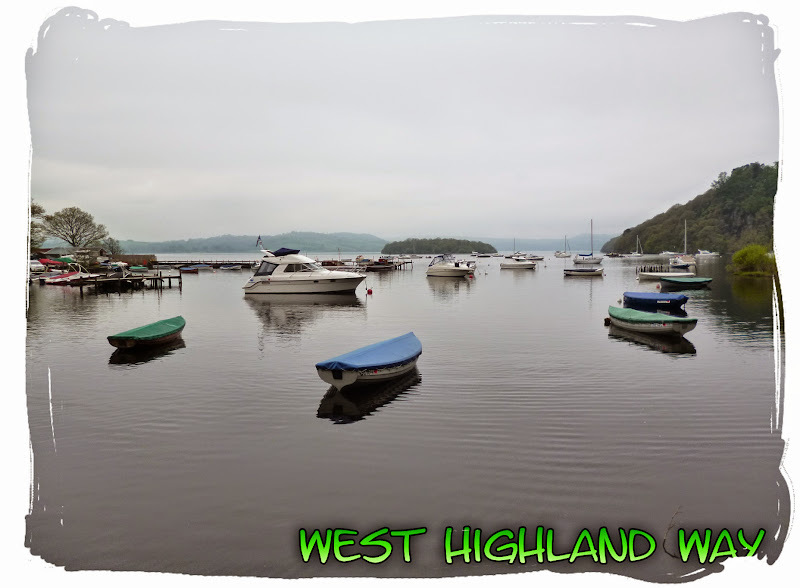 Balmaha to Sallochy Bay - 4 miles? 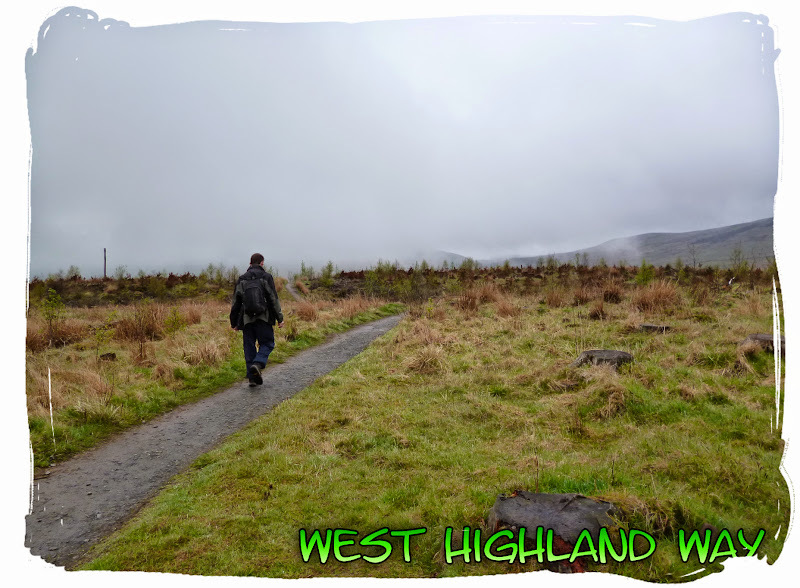 We left Drymen through the Garadhban forest (or what used to be a forest) and climbed over a very misty Conic Hill to eventually arrive at Balmaha and the foot of Loch Lomond. 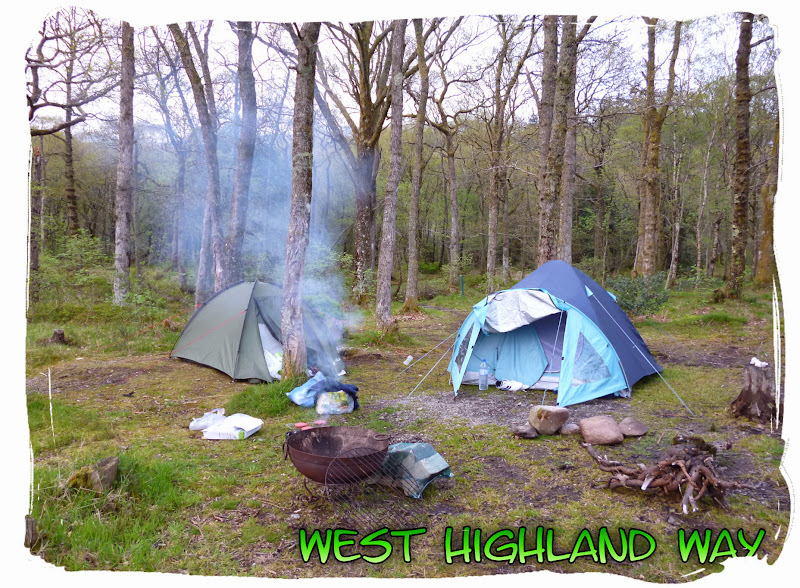 The de-forested Garadhban - once a popular spot for a wild camp, now a bit of a mess. 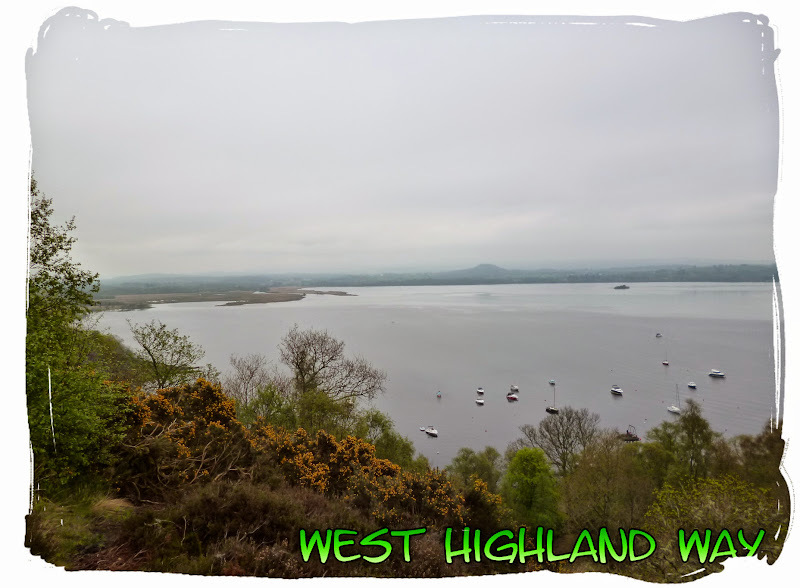 Coming down from Conic Hill, towards Balmaha. It was busy up there. 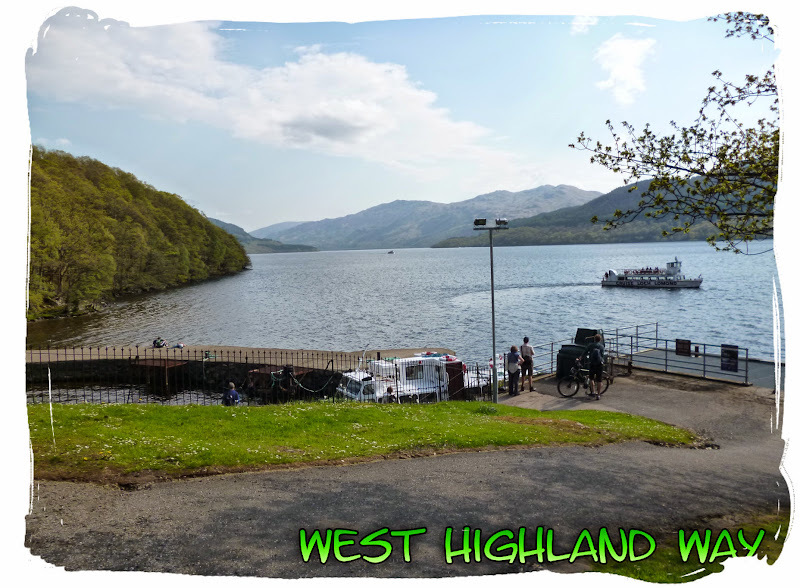 We made use of the facilities at Balmaha before replenishing our supplies at the village shop and heading off around the loch, towards Rowardennan. 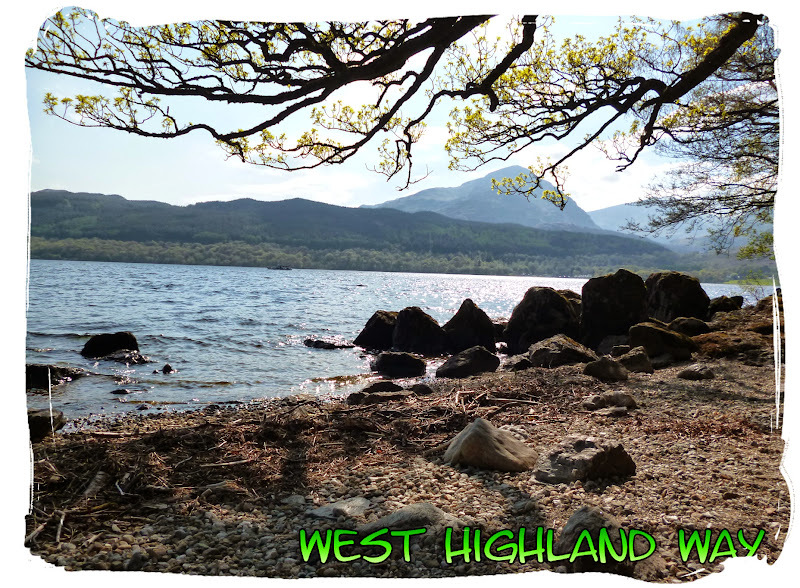 We didn't go as far as Rowardennan as we had pre-booked camping at Sallochy Bay, about 3 miles before Rowardennan. 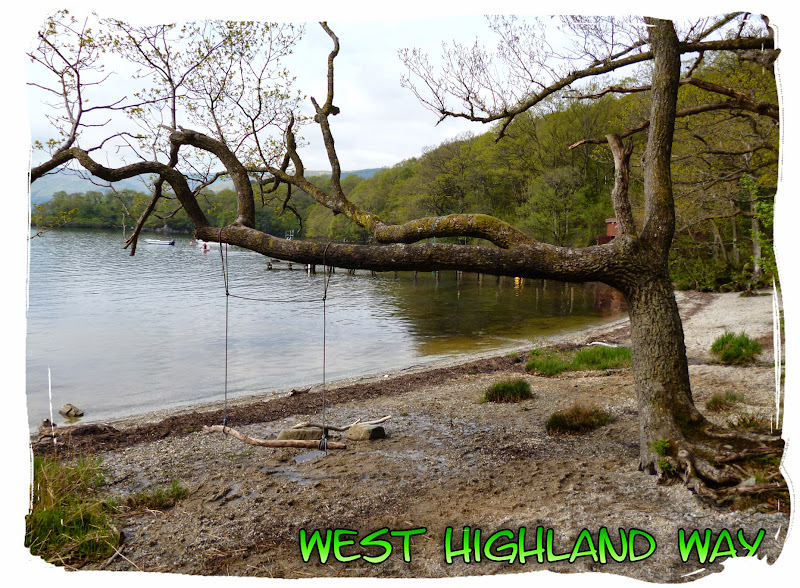 This is a really nice place to camp, especially if you book a pitch by the loch (which I did). 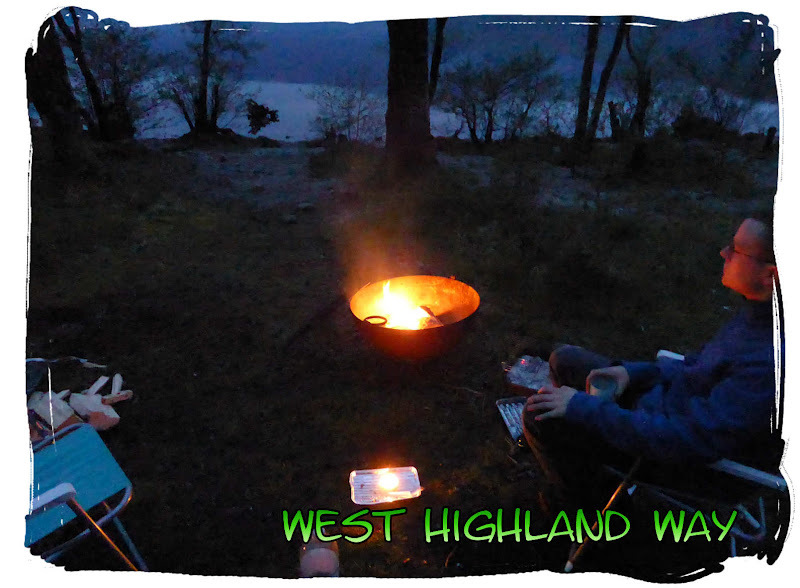 We arrived at Sallochy Bay at about 4.30pm and then waited a short while for the warden to arrive so that we could show our reservation, rent a firepit and buy some firewood. 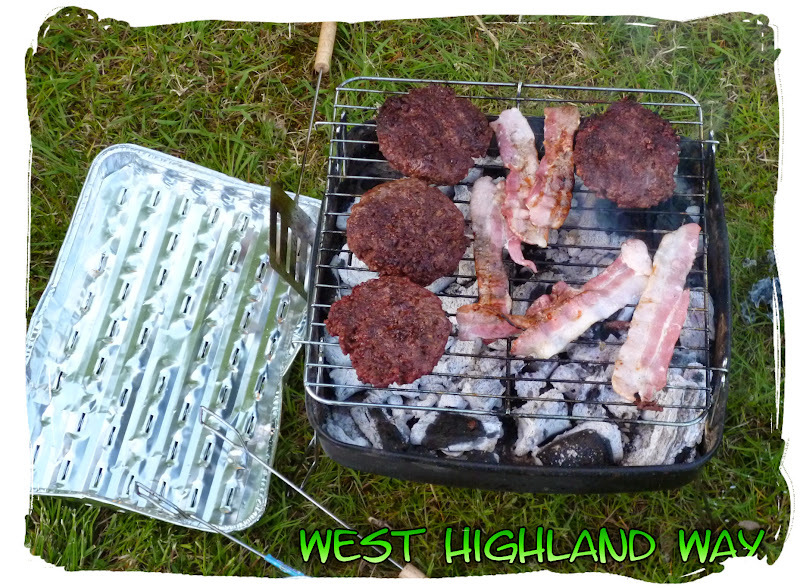 We chose a perfect spot by the lochside where we could play music without disturbing anyone then got the BBQ fired up, the tunes on and the non-labeled vodka poured ready for a relaxing Sunday evening tipple by the loch. It kept dry throughout the evening and even the temperature through the night was awesome, as I remember not even needing my sleeping bag. It was a grand evening. 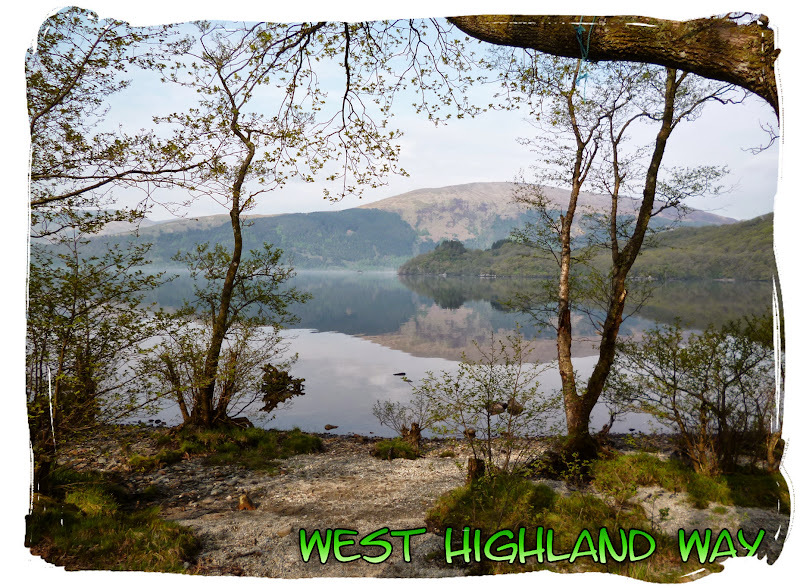 Several hours later after regaining consciousness, we woke up to a beautiful morning by Loch Lomond, the sun was shining, the birds were singing, but my head was stinging. 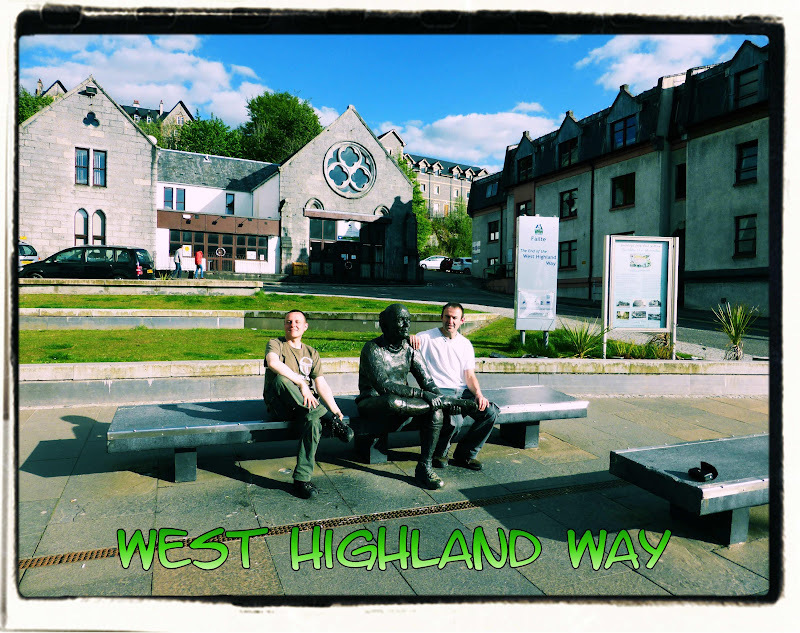 We had breakfast (the usual porridge pot and a coffee) before packing everything back into the van and setting off on a long walk towards Inverarnan. My Dad would meet us at the other end. 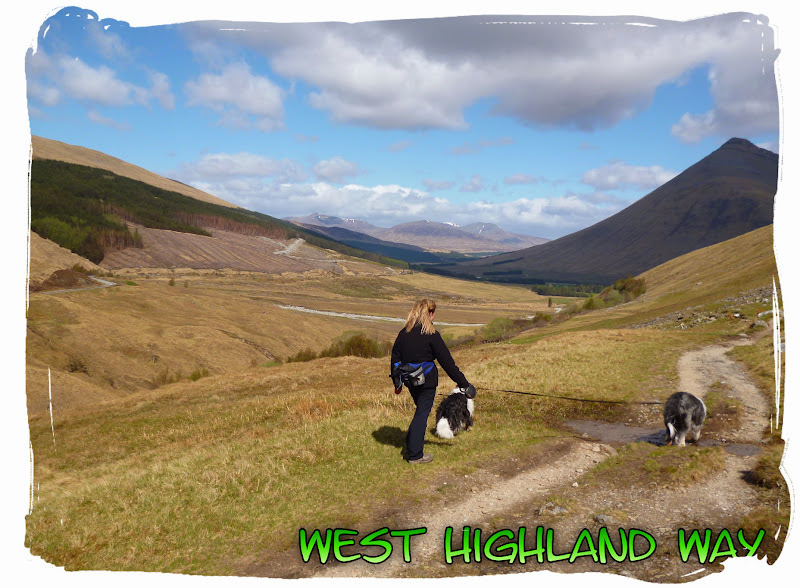 This would be our hardest day of the week, a walk of approx. 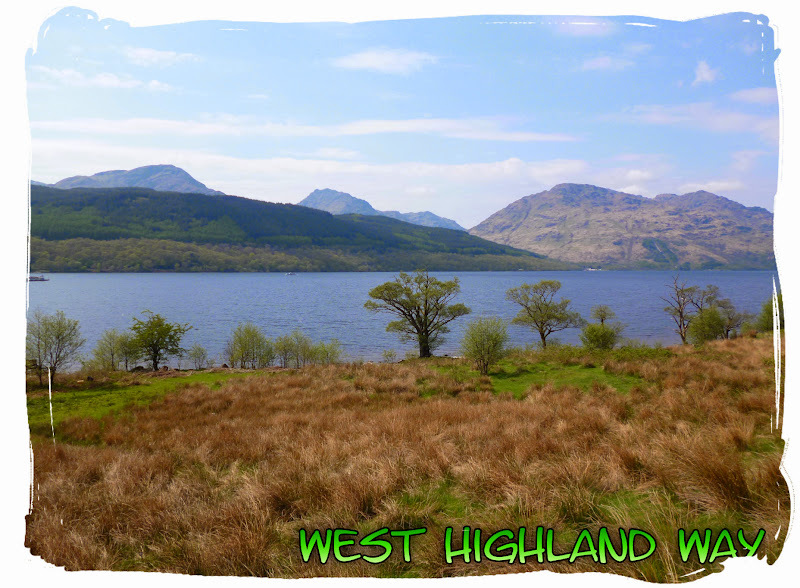 17 miles to reach the top end of Loch Lomond. 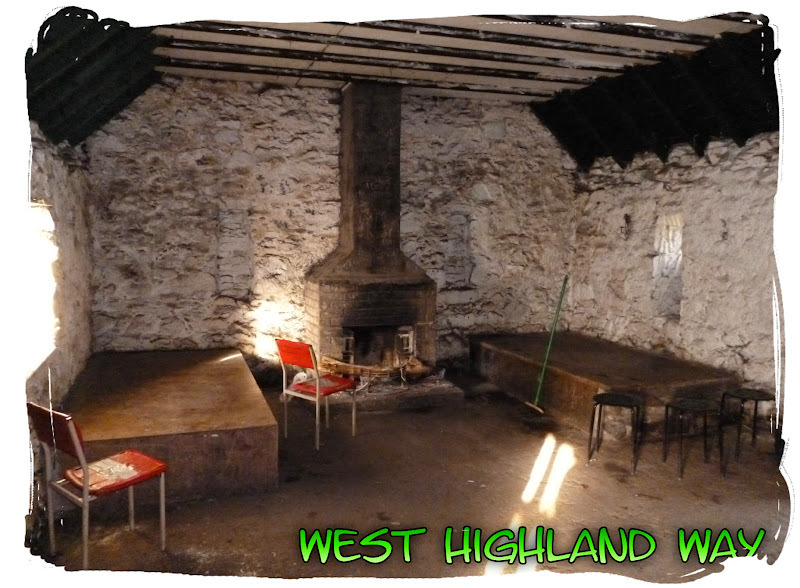 The plan was to get a nice meal at the Drovers Inn when we finally arrived at Inverarnan. 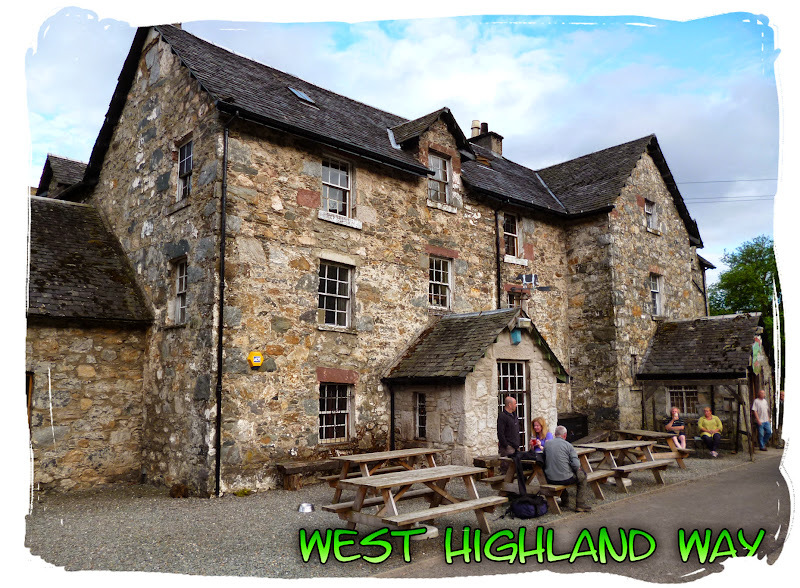 It took us a couple of hours to reach Rowardennan where we stopped for a drink in the beer garden at The Rowardennan Hotel. 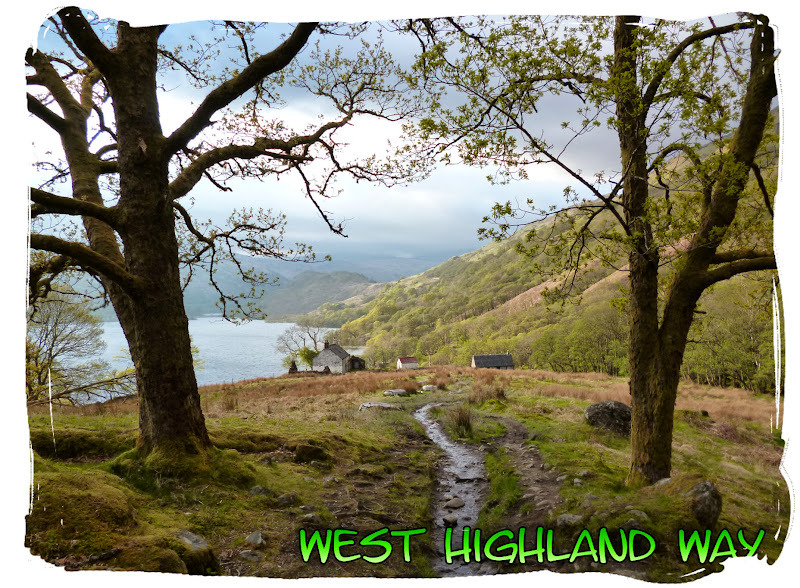 Then we carried on through Rowardennan, passing the Youth Hostel and the route up to Ben Lomond, following forest tracks and some of the lochside path to reach Inversnaid where many other WHW walkers were congregating. It must have been around 4pm that we passed through Inversnaid. It had turned out to be a really nice day. We stopped at the Inversnaid hotel to use the facilities and enjoyed a refreshing, cold glass of Coke from the bar before pressing on. We thought about ordering food but decided against it as we'd brought noodles. 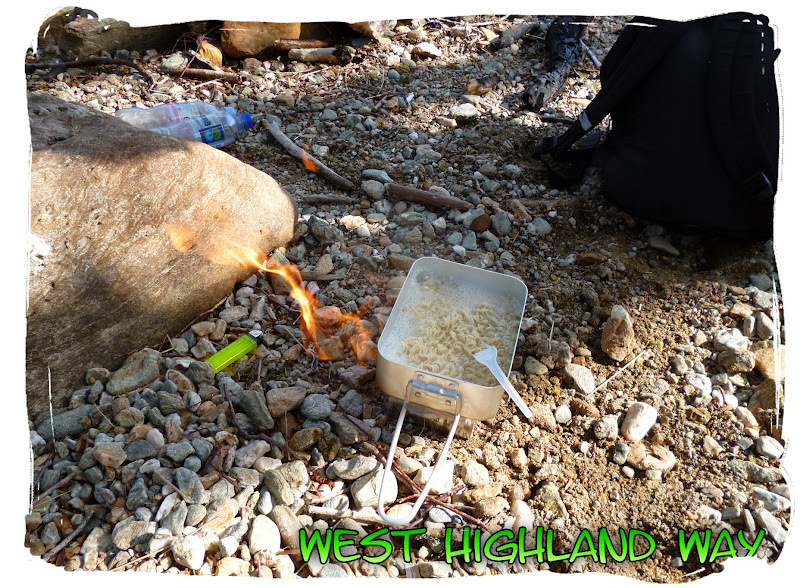 So we continued on a little farther until we reached a small beach area where we sat down for a rest and made our noodles. Pressing on past Inversnaid as the sun lights the way, it was a warm afternoon. 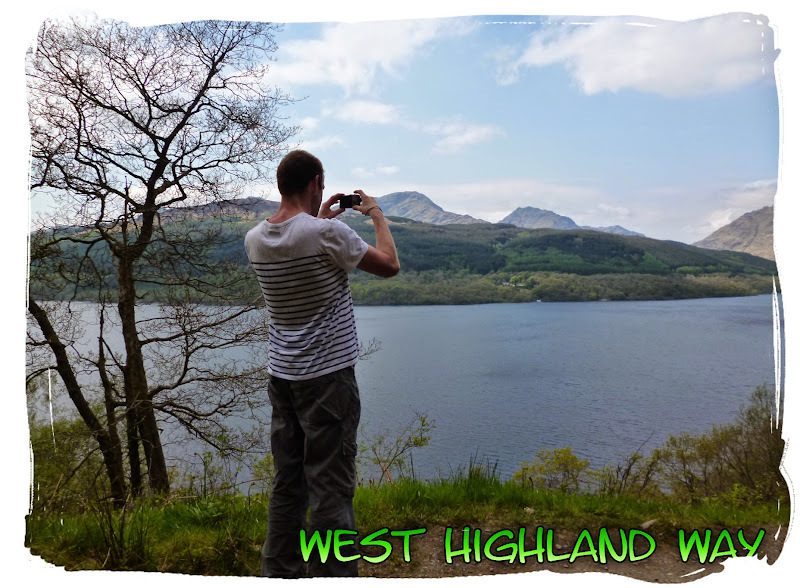 The next stage was interesting as we followed a rocky lochside path to reach the top of Loch Lomond. 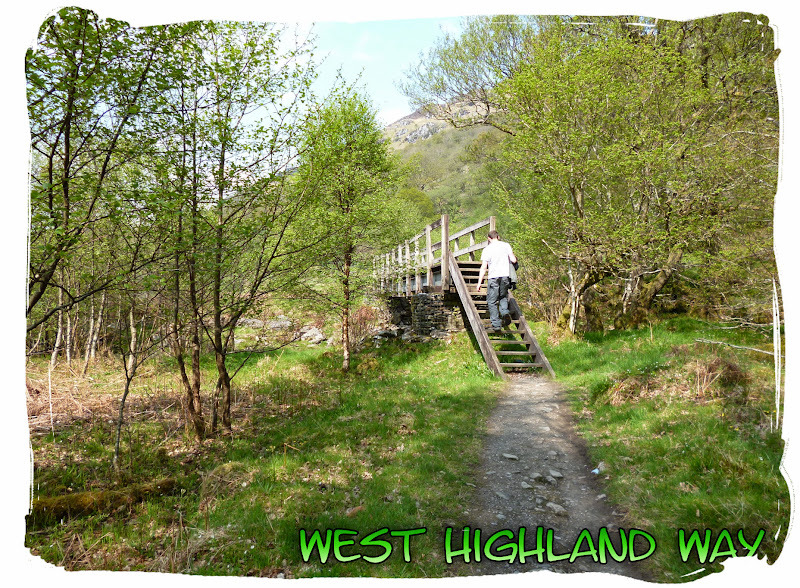 It actually felt like we were on an obstacle course as we scrambled over steep muddy paths, giant rocks and tree roots, climbed over gates and crossed small wooden bridges for the next few miles. A real life game of snakes and ladders it was, but an enjoyable experience and the many ferile goats we met here also seemed to be enjoying themselves. I'm not so sure it would've been enjoyable if it had been raining. 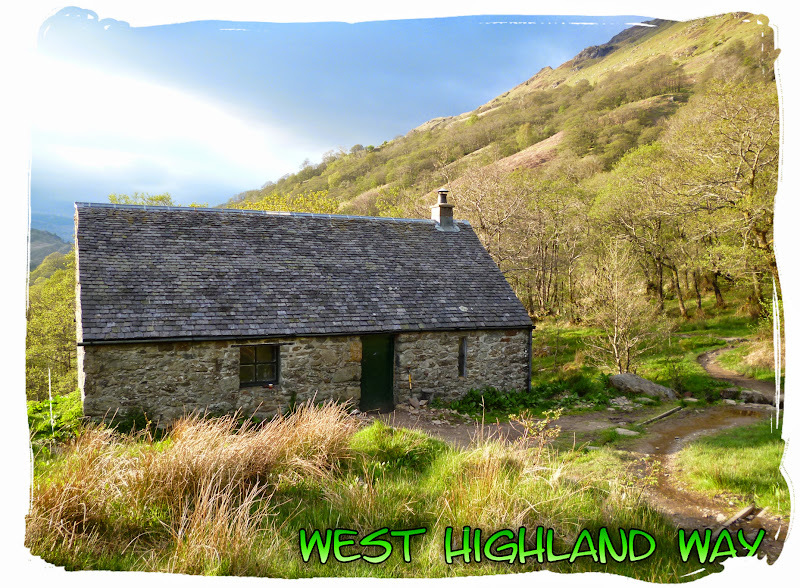 We continued along the lochside path into the evening, eventually passing by Doune bothy. There was nobody home so we gave the place a quick inspection. It was up to my standards. 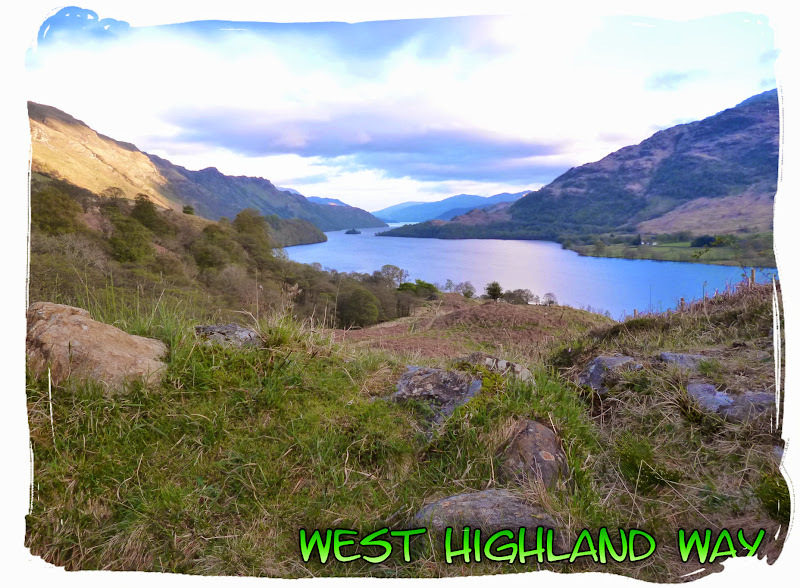 Some time (much) later we finally completed the bonny banks of Loch Lomond and began to approach Inverarnan as the sun began to set. 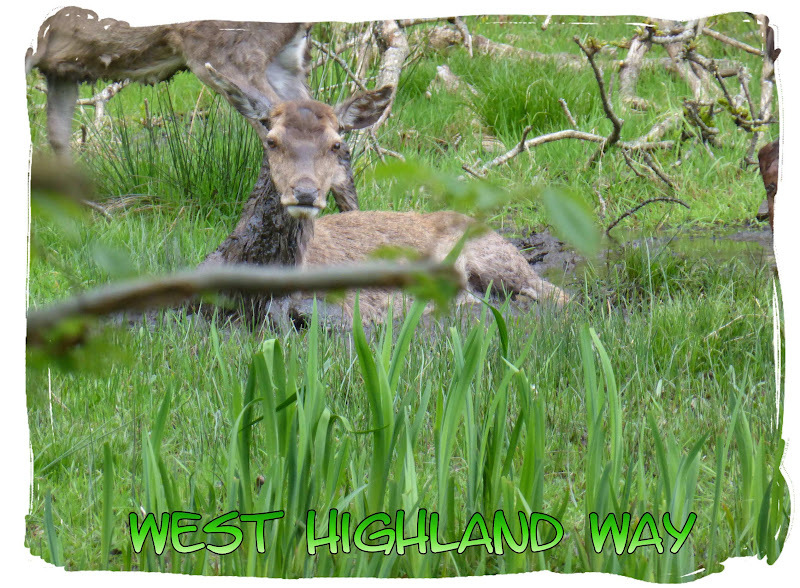 We passed a herd of wild deer while nearing completion of the loch, they seemed a little offended by our presence. 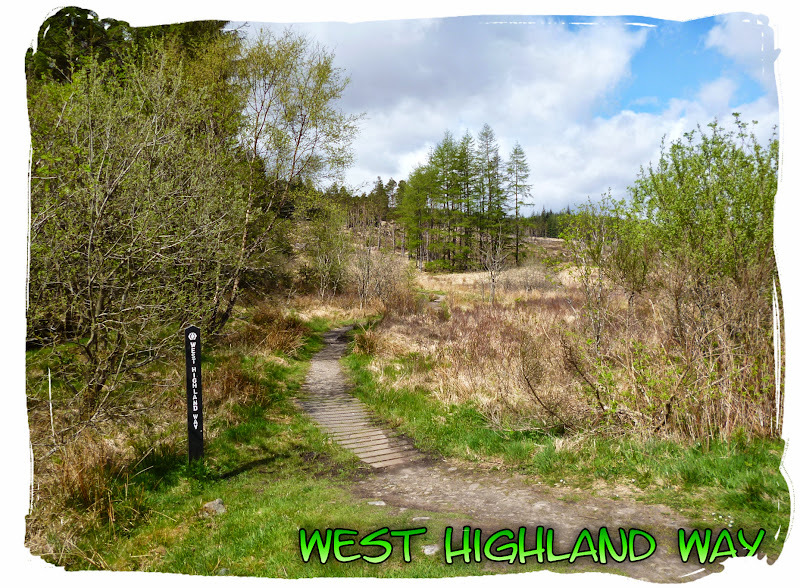 It started off another bright and sunny morning as we set off on a 6 mile walk, across open moorland, towards Crianlarich, followed by another 6 mile walk, mostly through forestry to reach Tyndrum. 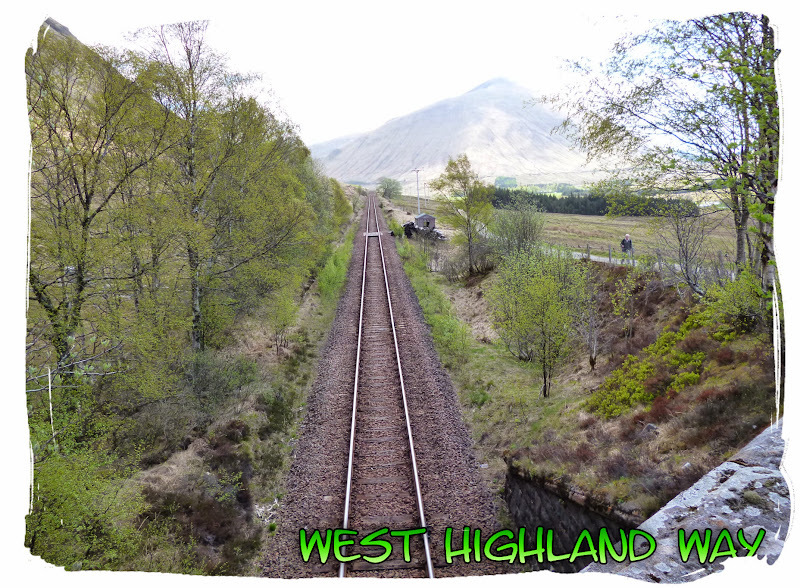 We didn't need to stop at Crianlarich for anything so avoided the turn off and kept walking. 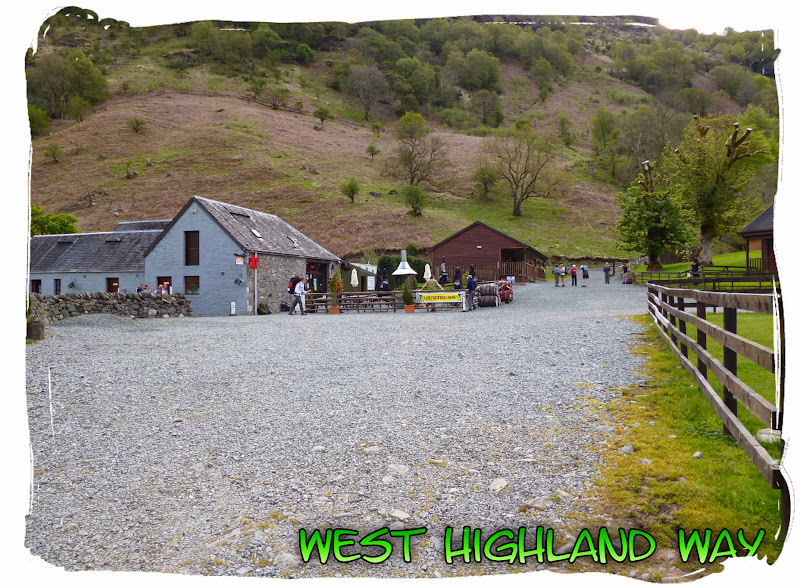 It was a reasonably short day, arriving in Tyndrum by mid afternoon. 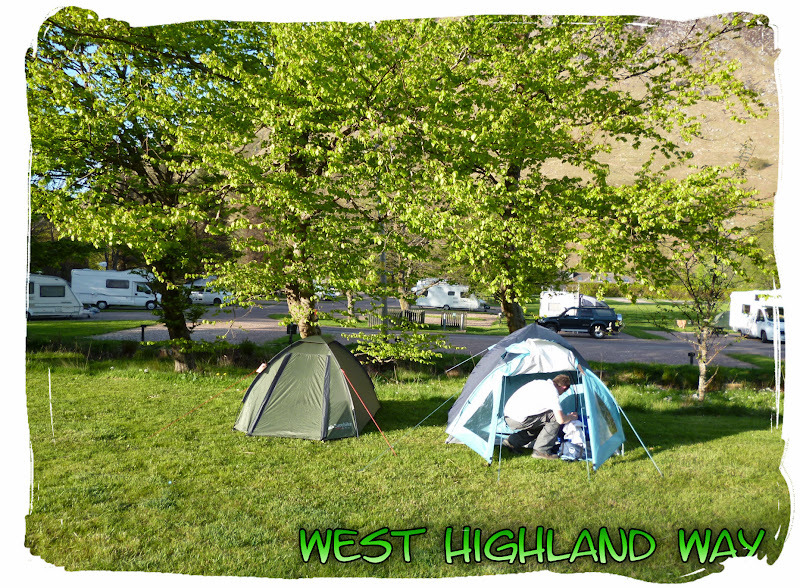 We got the tents put up at 'By the Way' campsite then my Dad drove us back down to Inverarnan where we enjoyed a meal at The Drovers, since we never made it the previous night. 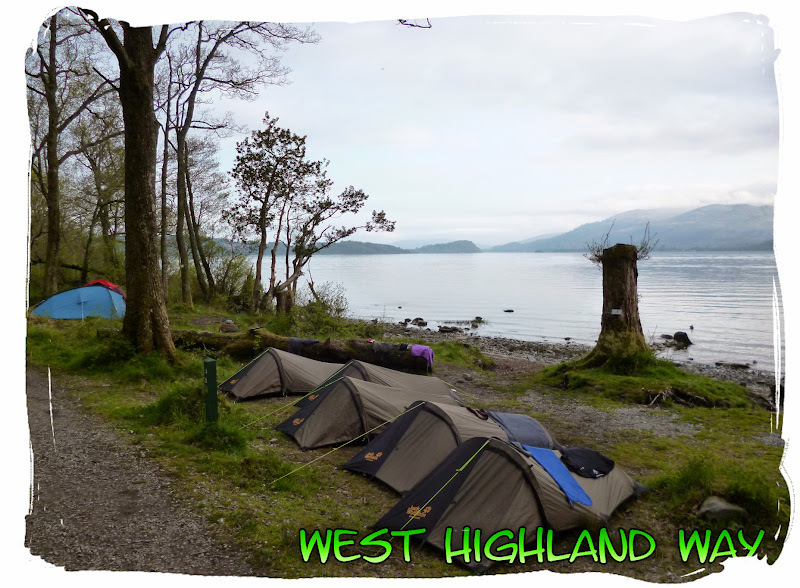 Then it was back to the campsite for another peaceful sleep, seeing us fit for another long walk. 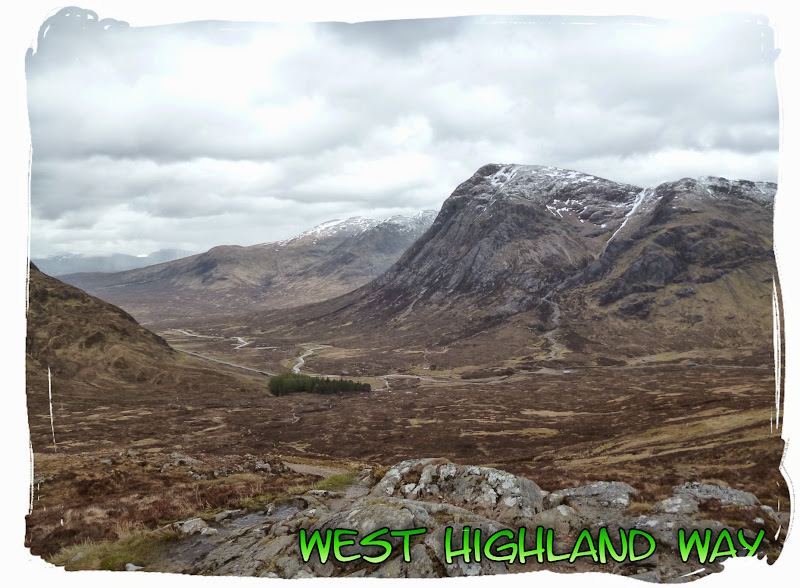 On day 5 we were joined by some of my family members, who had driven all the way up from the south for a long weekend at Glencoe. 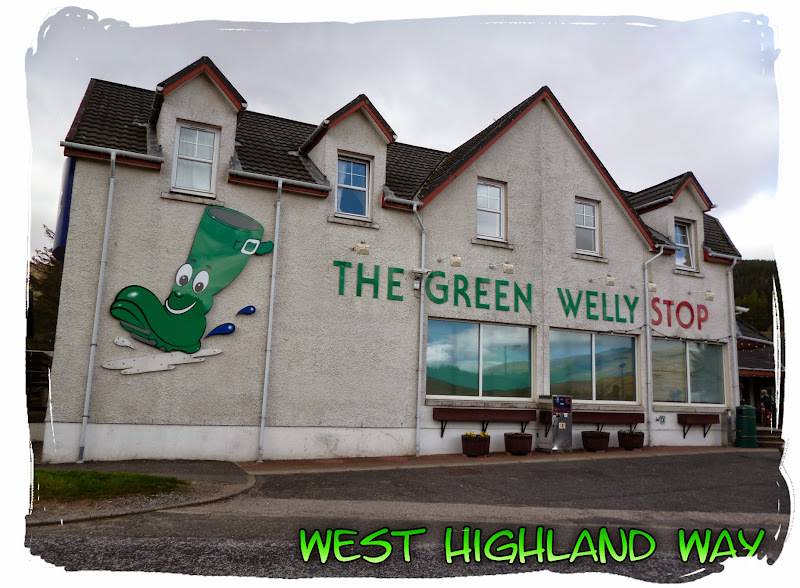 They drove up early to meet us by the Green Welly Stop where we grabbed a Coffee and supplies before heading off towards Bridge of Orchy. 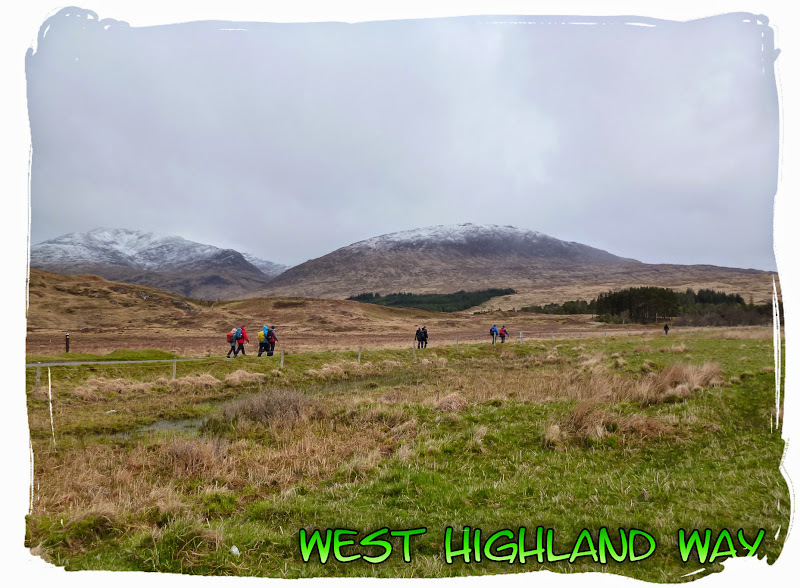 We got off to a late start but this would be our shortest day, covering only 9 miles to reach Inveroran. 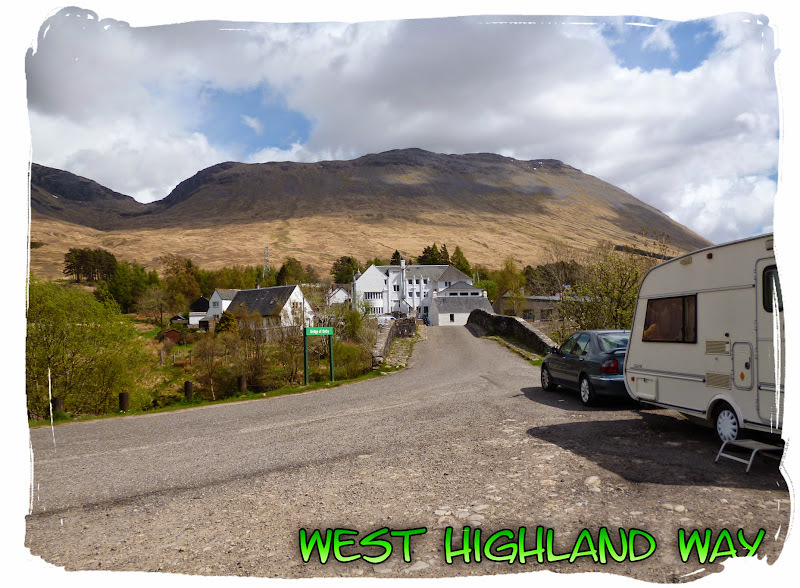 We picked up the old military road, never losing sight of the railway to arrive at Bridge of Orchy 7 miles later, where we stopped for lunch at a picnic bench by the river. 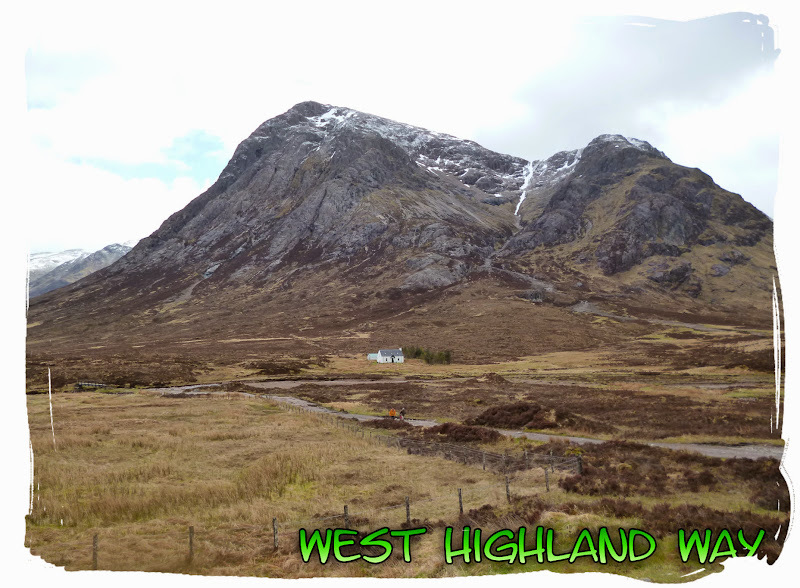 My family left us at this point and drove off to Glencoe to do their own thing. My Dad stuck around with our gear for an hour until we reached Inveroran. 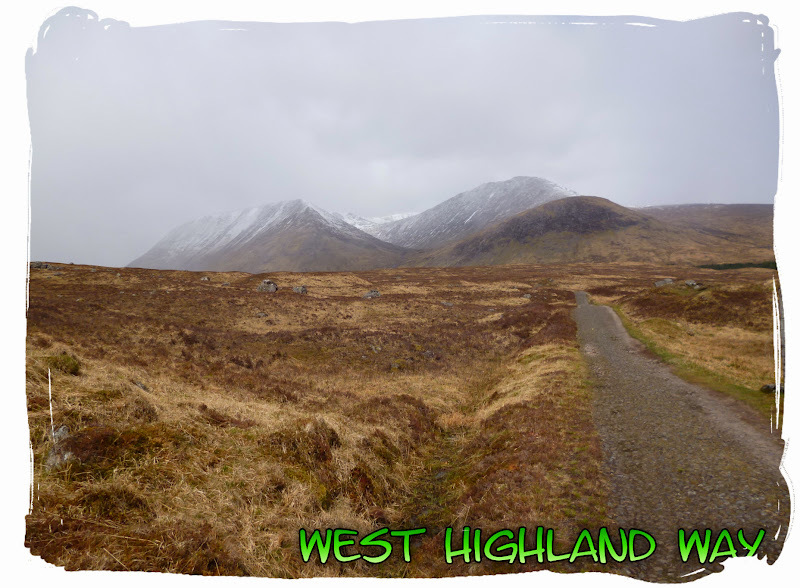 It didn't take us long to reach Inveroran as the weather began to take a turn for the worst. 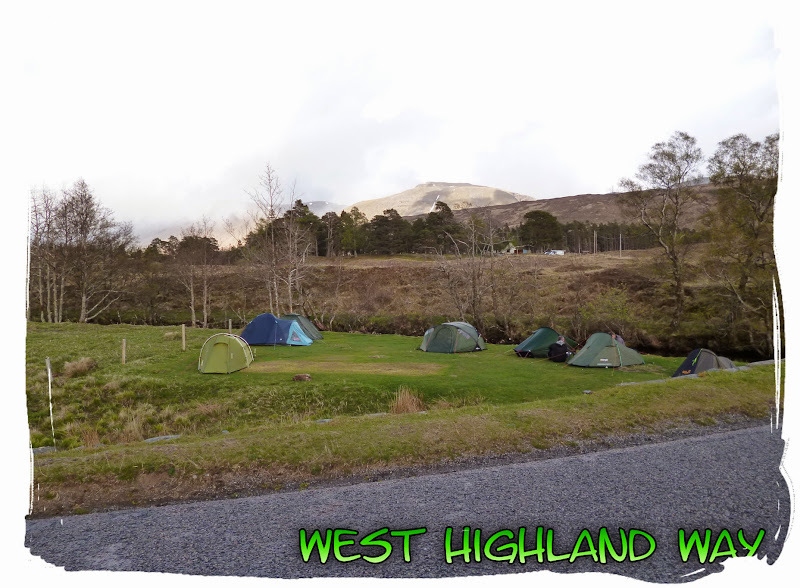 The Inveroran camping area was a little further on past the Inveroran Hotel. 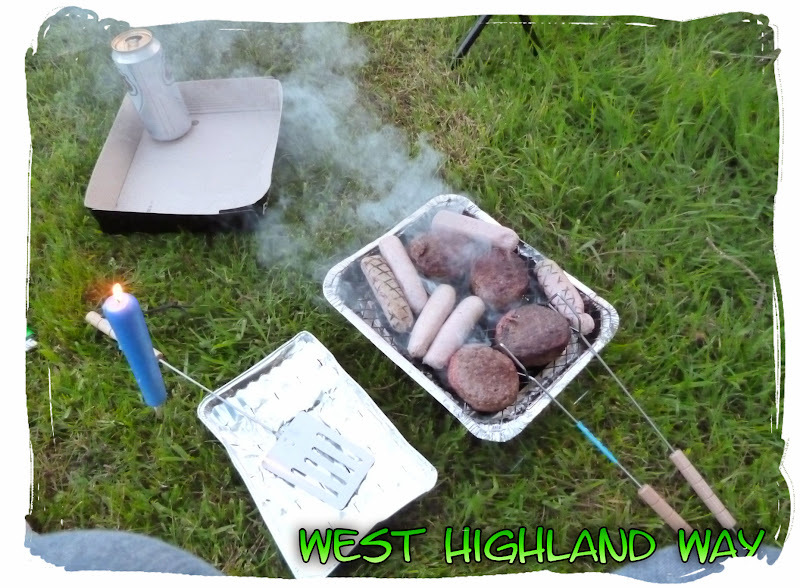 The original plan once reaching the camp was to have another bbq and a tipple by an open fire, I had even collected some firewood but unfortunately it wasn't meant to be as we began to experience all seasons of the year in one day. 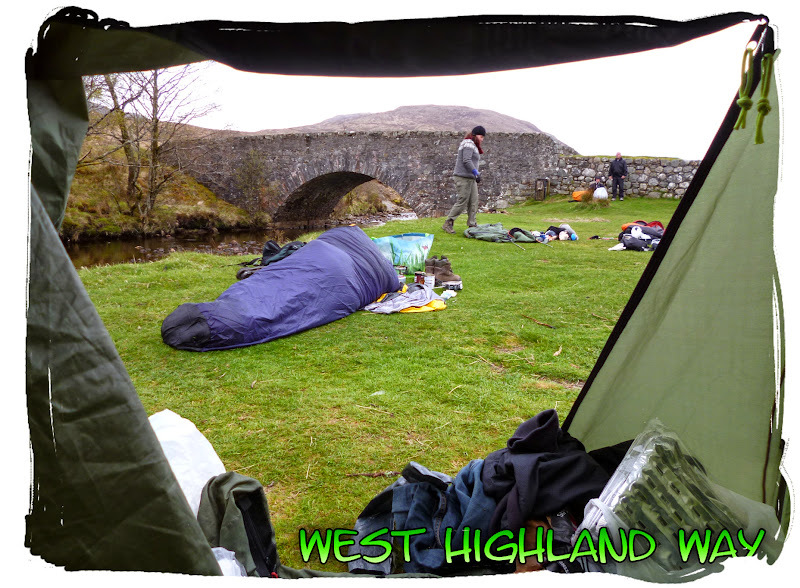 We became tent bound for the rest of the day as the area was suddenly bombarded by giant hailstones followed by random showers of rain, sleet and snow. It got very cold, winter had somehow returned in the space of a few hours. 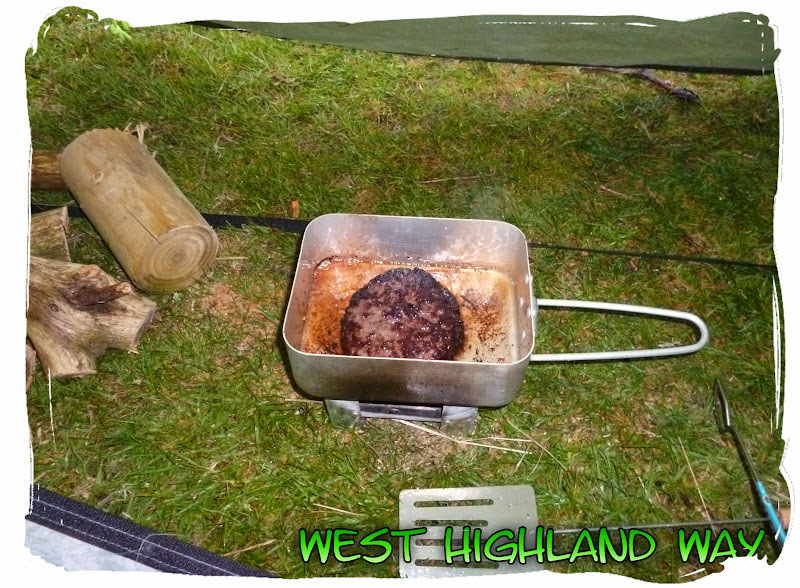 There wasn't much to do except cook inside my tent which I now know was a stupid thing to do!! That was followed by an afternoon nap. Throughout the evening more random walkers turned up, including some brave dude with a bivvy bag. i think he was drunk. Woke up to a cold morning and forced myself out of my sleeping bag, unzipping the tent for a peek outside. Most folk had already left and we were behind as usual, the man in the bivvy was still lying there though, not sure if he was actually alive or not. 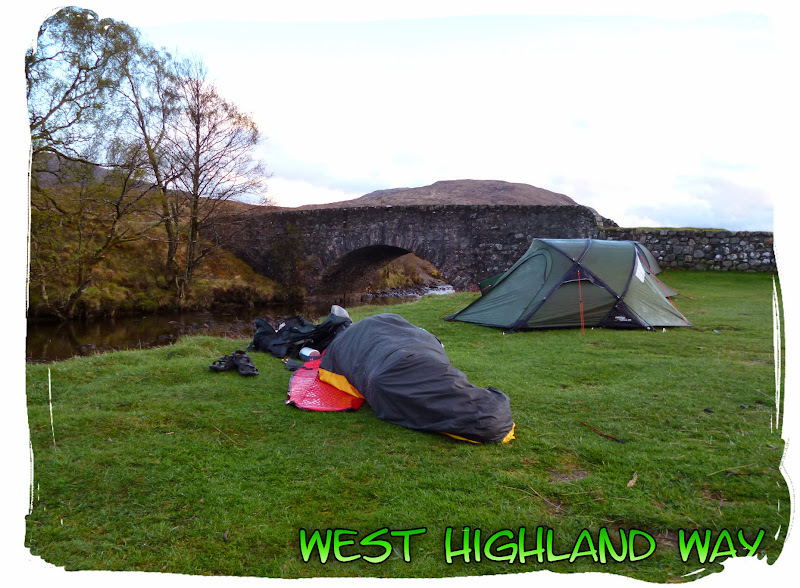 I woke JP up and told him to get a move on as we had a long day ahead of us, a 19 miler to reach Kinlochleven. Dude with the bivvy bag, he was still lying there in the rain the following morning once everybody else had left, I feel bad for not prodding him with a stick to check if he was ok.
We packed up and waited for my father to arrive in the van as he was once again taking our gear (lazy I know but he offered). The weather had calmed down a bit. We had some breakfast at the van before starting the next stage, towards Kingshouse. It rained pretty much all the way. 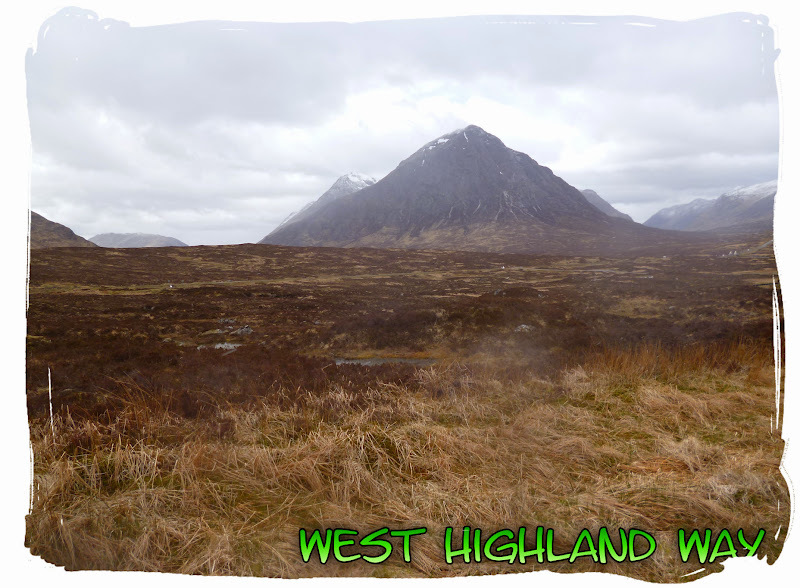 We stopped at the Glencoe Ski Centre cafe for a Coffee before plodding on a little further to reach Kingshouse, taking in some magnificent views of the mountains of Glencoe. 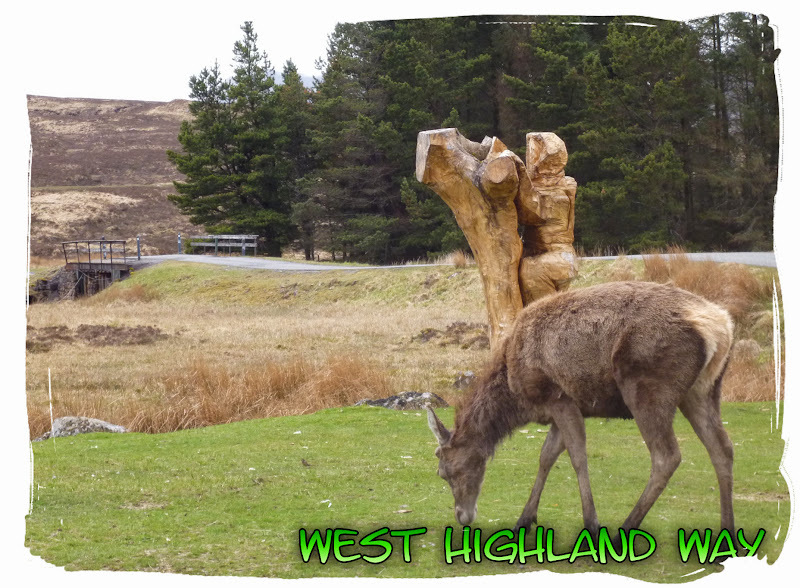 Upon reaching Kingshouse, the usual herd of wild deer were congregating outside the hotel, getting a little cheeky because we wouldn't feed them. Mooning Deers, wild animals can be so rude!! 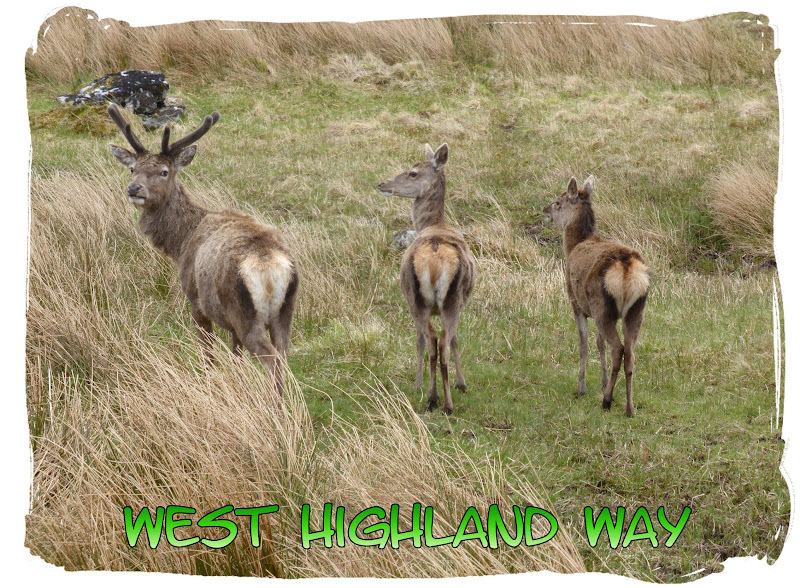 We were hungry but didn't stick around for Venison as the weather was pretty rubbish, we just wanted to push on, making our way around the back of the hotel, where there is a wild camping area for anybody who is interested. 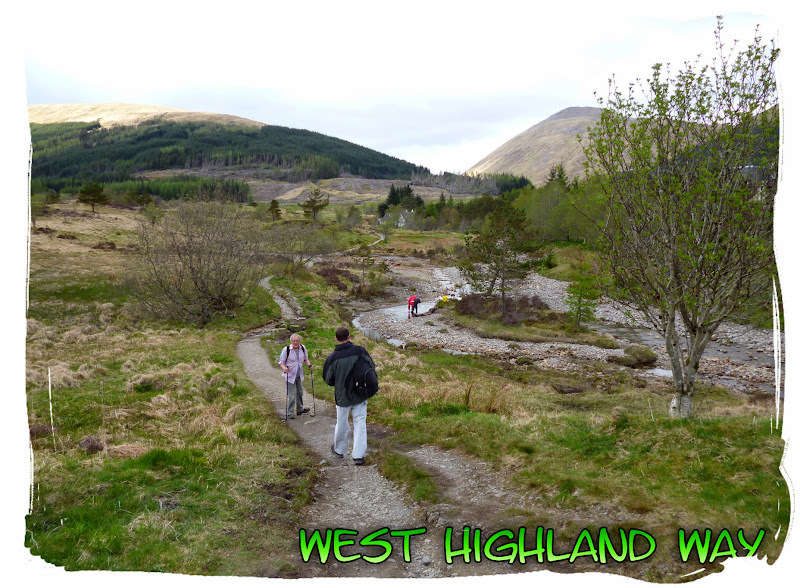 We made our way along the grassy path, which becomes parallel to the main road past Glencoe, to arrive at the bottom of Devils Staircase. 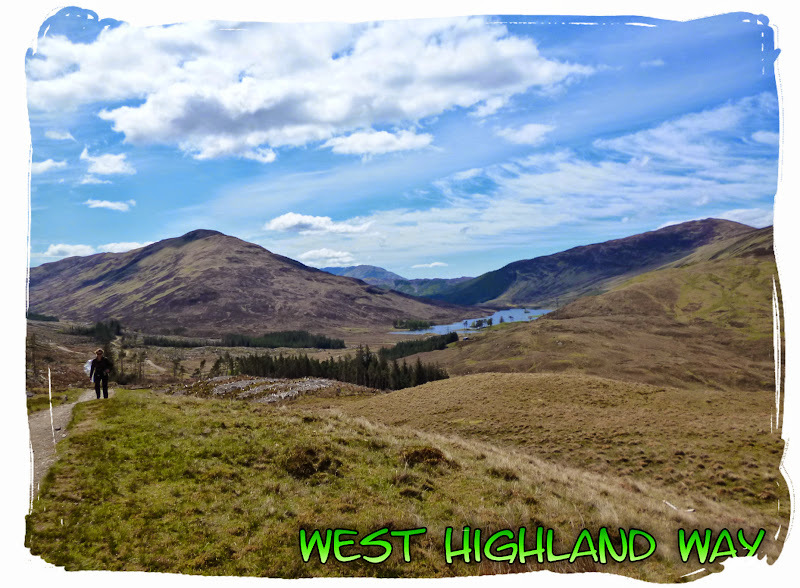 Some would say climbing Devils Staircase is the worst part of the walk but it was far from it, although maybe because we didn't have any packs to carry. 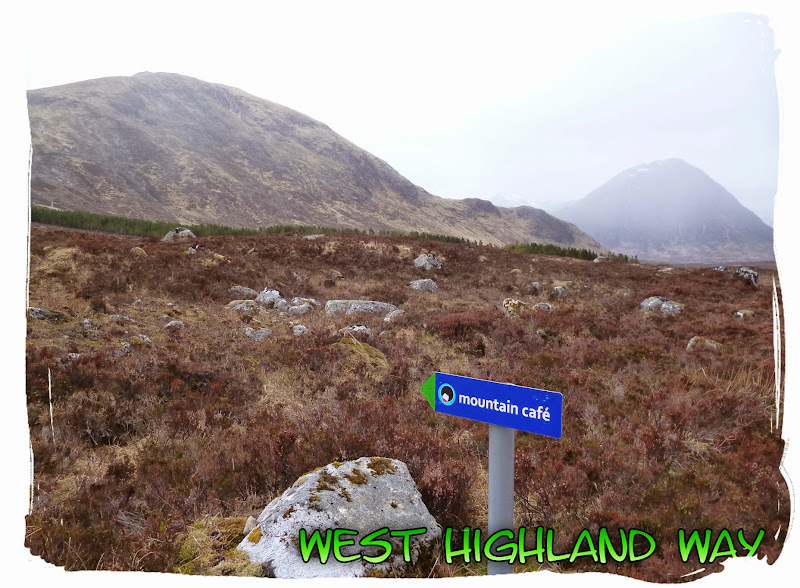 We then pondered on over through the mountains towards Kinlochleven (in the rain!!). 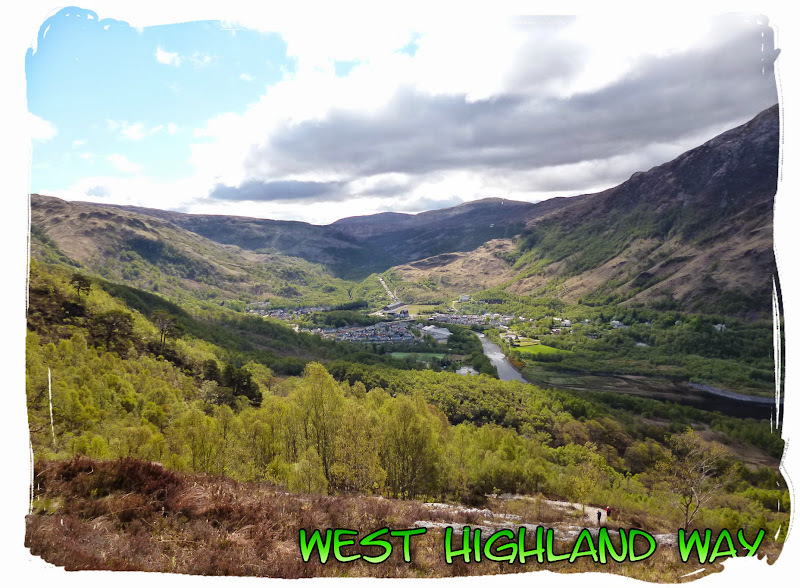 Eventually we were graced with the first views of Kinlochleven peeking through from the valley below, we began descending through the forest to reach Kinlochleven about 7pm. My Dad was waiting for us and gave us a lift to the campsite. 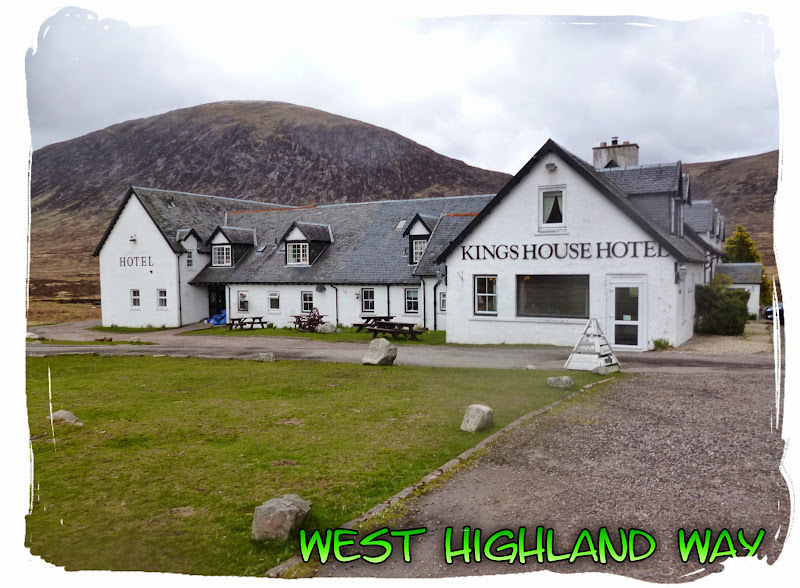 I had hoped to camp at the Macdonald Hotel & Campsite but forgot to book and they were all full up so we settled for the Blackwater Hostel instead. When we arrived it must have been about 8pm. 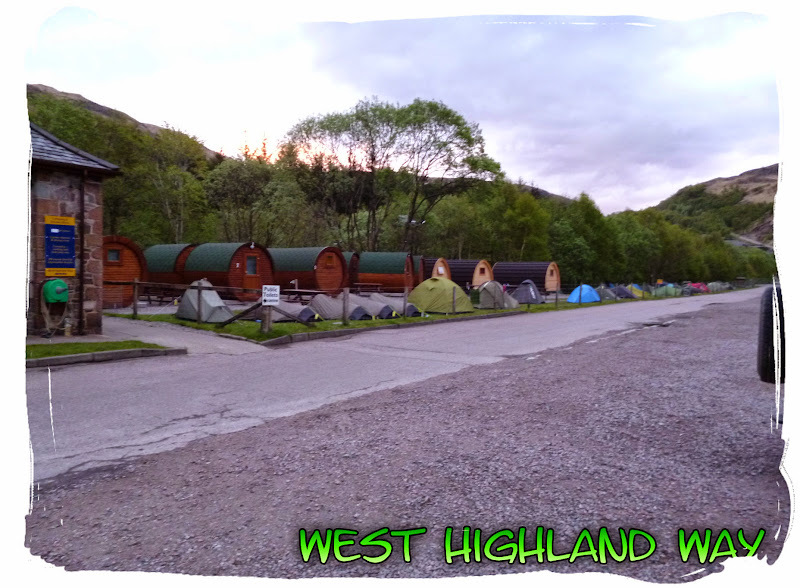 It was very busy but we managed to find a space and got the tents pitched up before a walk up the town. 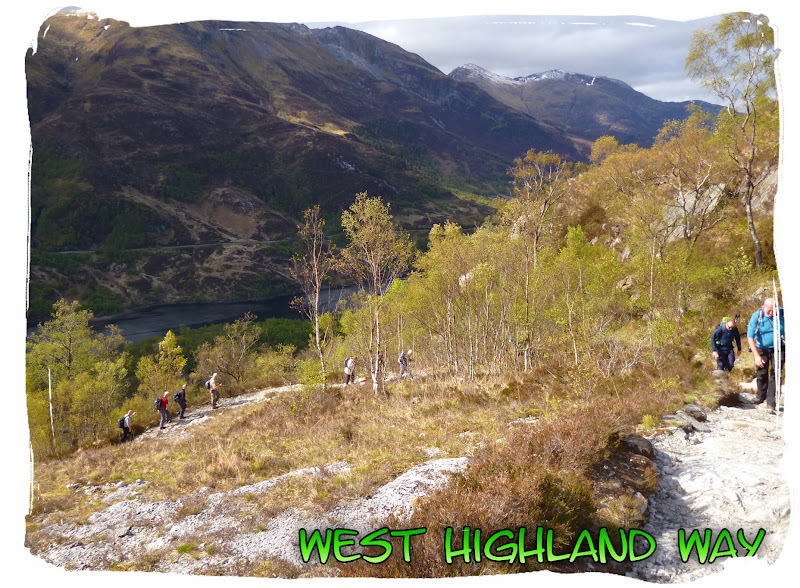 Our final day had arrived and after a steep climb out of Kinlochleven we were eager to reach the finish line. 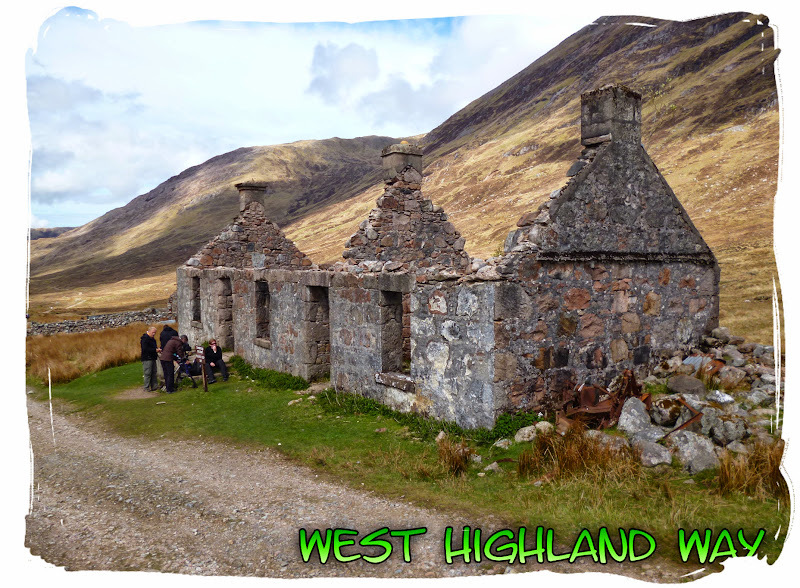 We made our way through the mountains, stopping at the ruined farmhouse for lunch as the big bright thing in the sky made its return. We stopped again for a noodle break about 2pm as the weather got really hot. It stayed nice for the rest of the day and we began looking forward to a nice cold beer and a long overdue barbecue. 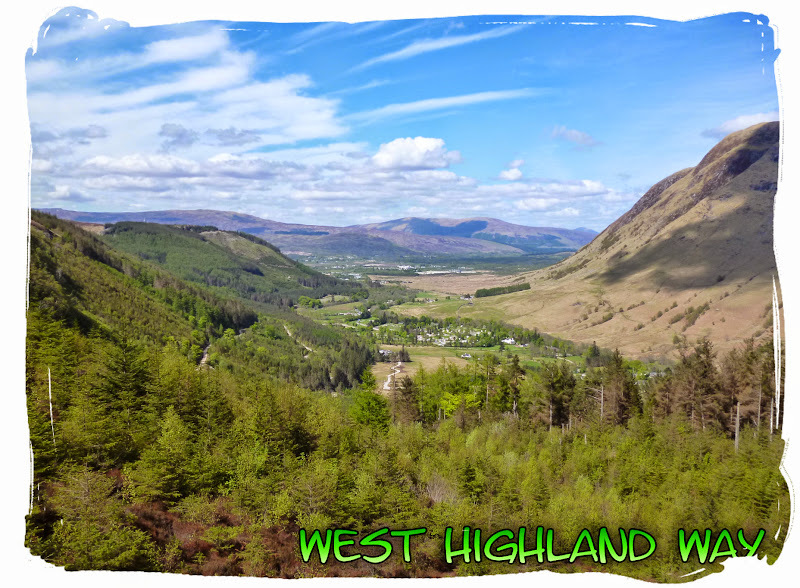 ...and after a depressing stroll through yet another de-forested forest (what a mess), we eventually arrived at Glen Nevis campsite about 4pm where pitched up before walking the last couple of miles into the town to reach the original, and then the official end of the West Highland Way. 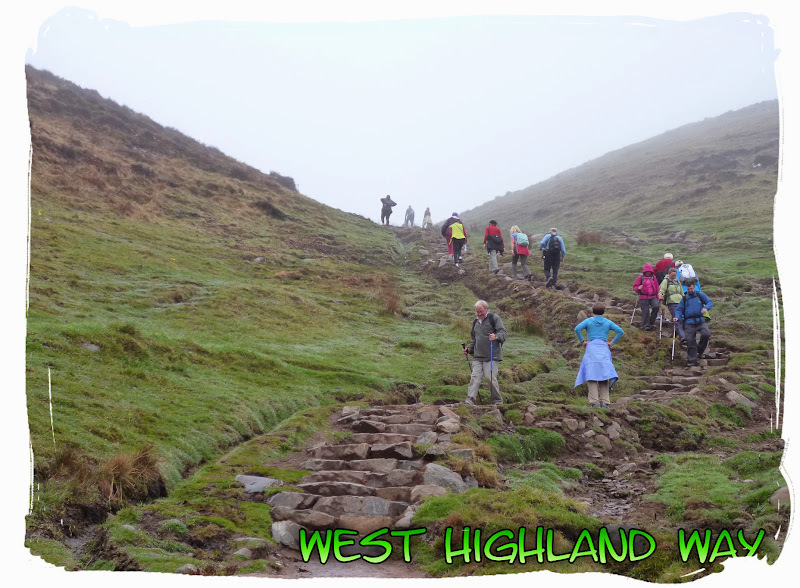 Some other walkers offered to take our pic, which we accepted then it was off to Morrisons for the barbecue and Beers, lots and lots of Beers. Barbecue and Beers, I think we earned it! 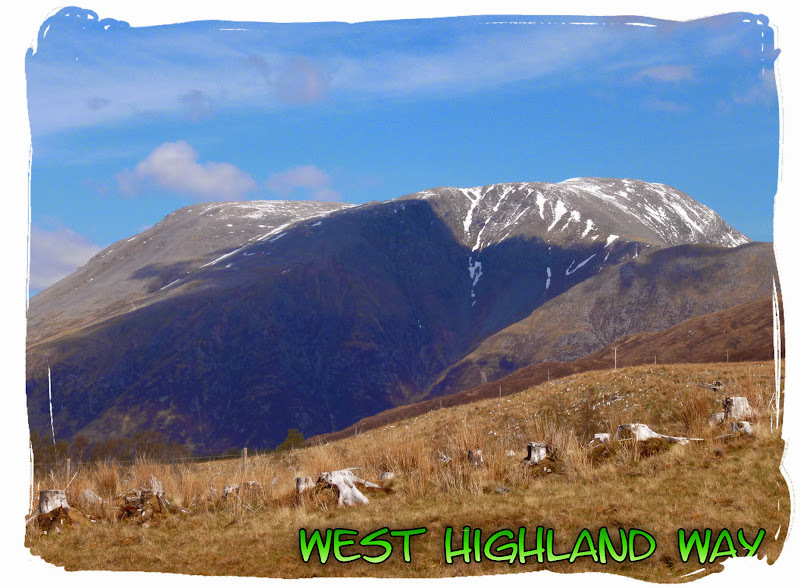 BUT I cheated ... so I'll need to go back to the start and do it all over again, WITH the heavy pack, perhaps in 2015? Hope you enjoyed the report as much as I enjoyed the hike. Last edited by andrewl7642 on Mon Aug 22, 2016 7:00 pm, edited 22 times in total. Me and gf just completed it in 7 days also, we B&B'd it the whole way though. Who carried your gear? 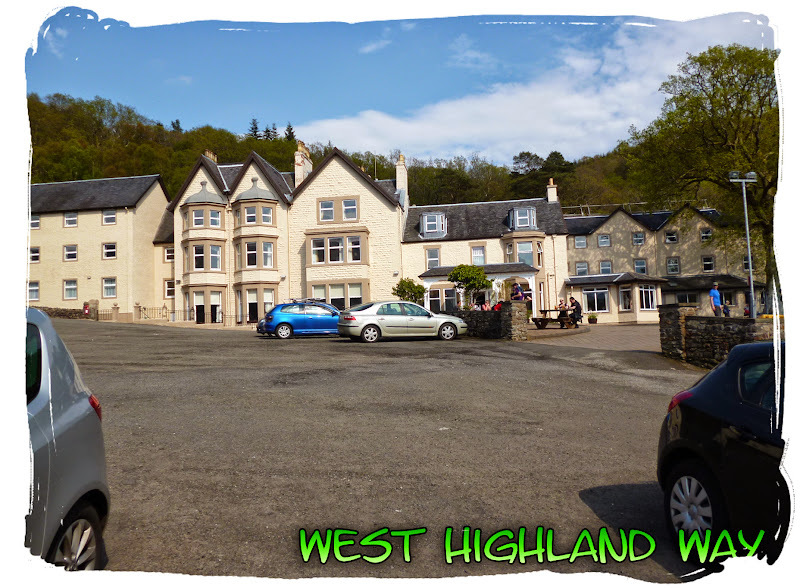 Did the courier comp drop off at wild camp sites like at Inverornan, or did the hotel take it in? What did you think of the new end point? I was quite disappointed, I think it should have stopped at the park at the other end of the main street. That way the whole theme of travelling would be maintained i.e. 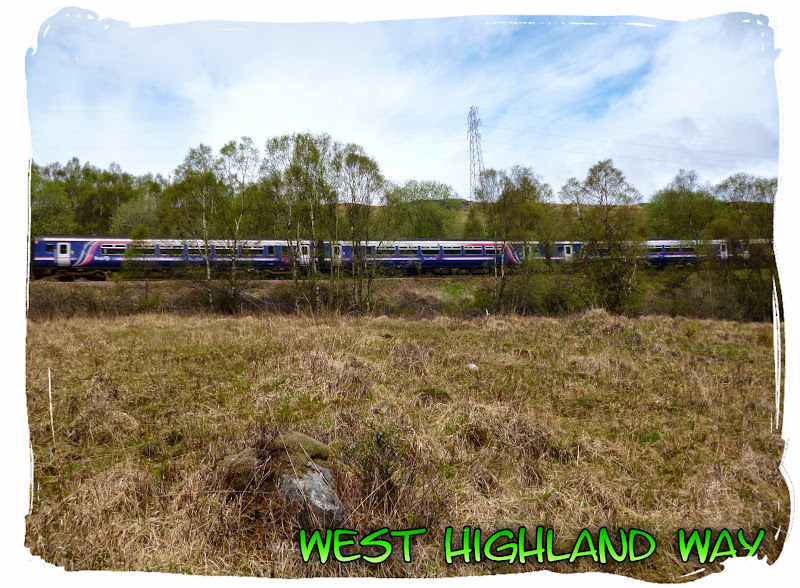 starting near Milngavie station, finishing near Fort William station. I think it is a bit cynical to get people who have just walked through lovely countryside to have to walk up a main street, seems like they just wanted footfalls on their main street to me. My father carried our gear, he's good like that. 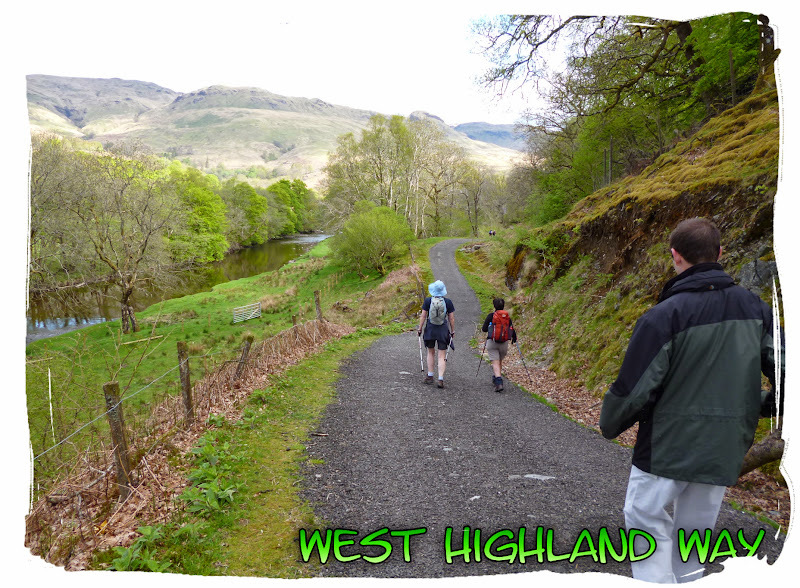 He helped us with The Great Glen Way as well, although it did feel like cheating. He was going to walk it too, but his legs aren't what they used to be, he managed a couple of stages though. The new end point was a bit of an extra trek yeah, they should maybe just have left it where it was and added the statue of the walker. 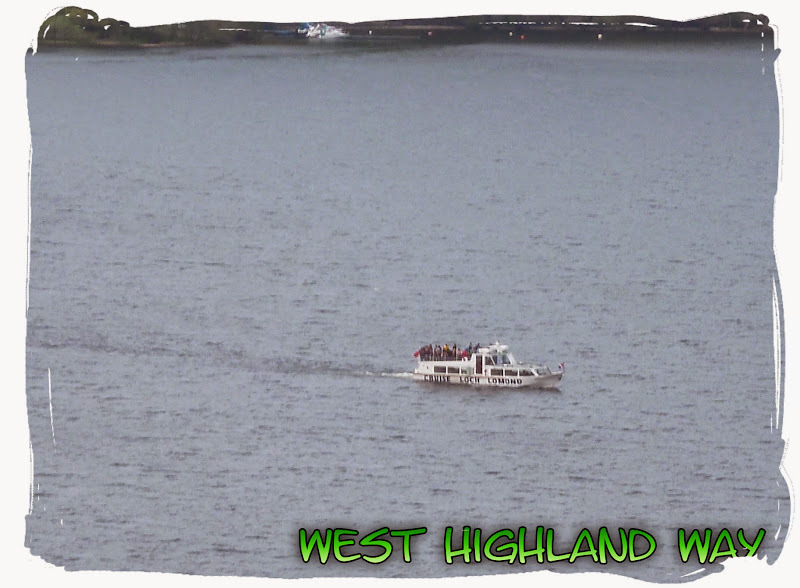 Didn't bother me too much though, it gives you a chance to see the town and the water front. 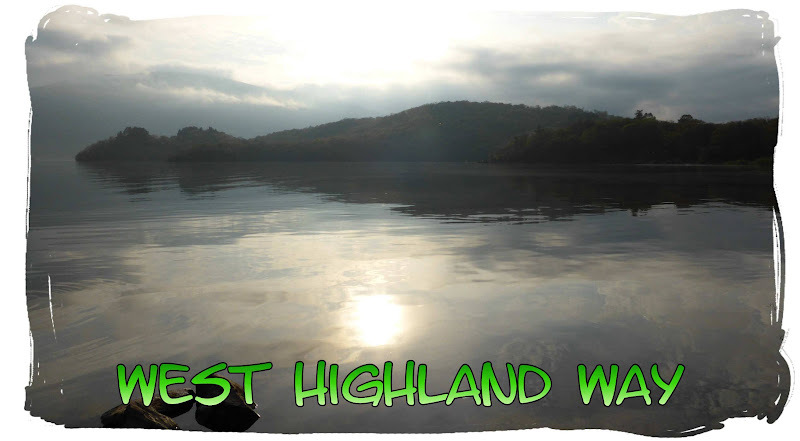 The East Highland Way is next for me, but taking the challenge this time and carrying my gear all the way... a first, I'm sure it will be fun! What bout you? 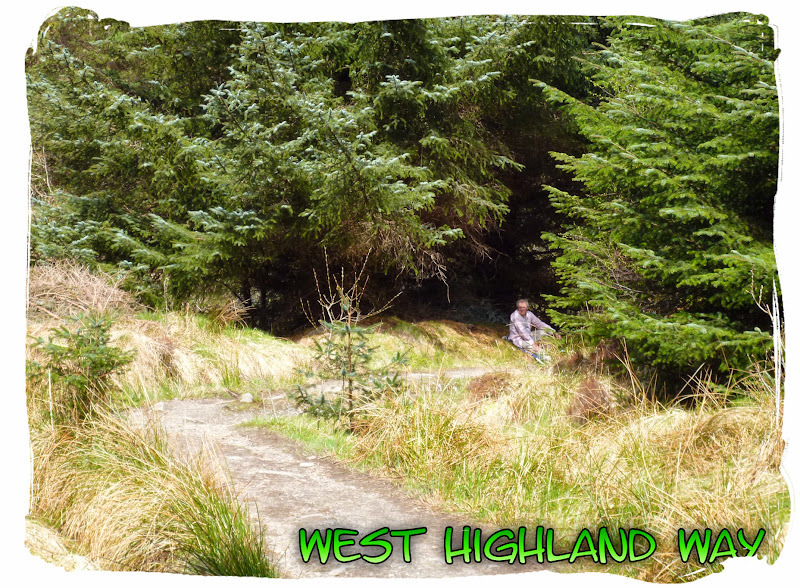 Have you done or are you planning to do any other long distance routes? 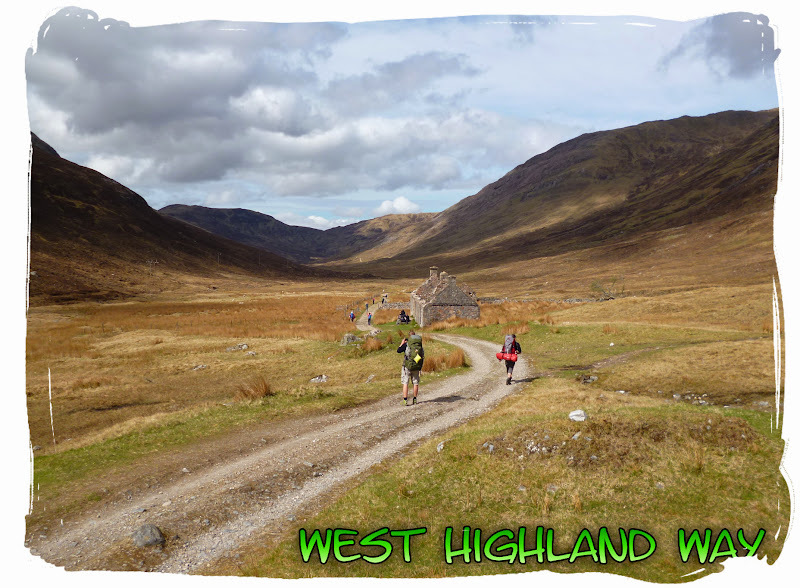 Best of luck with the East Highland Way . We did it in March 2013 over 5 days. Please contact if you need any advice or guidance. Read my brief review from 26/03/13. I agreed with them changing the end, the original end was a bit of an anti climax, but when I heard they were extending it to the main street I thought (and still think it would have been better) it would be at the park in front of the Alexander Hotel, I think that would have been the ideal finish. 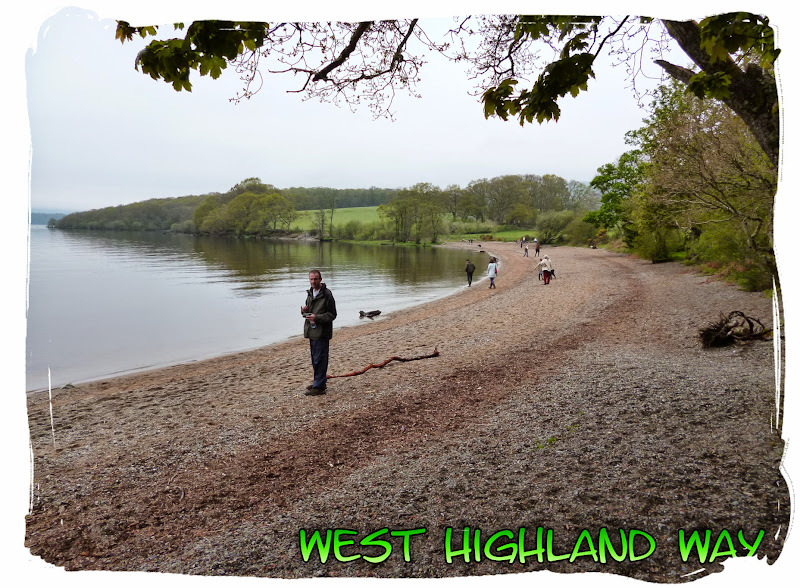 I haven't done any other long walks, have done the WHW 3 times, first time for charity, second time to enjoy and the third to enjoy and include the new end point. 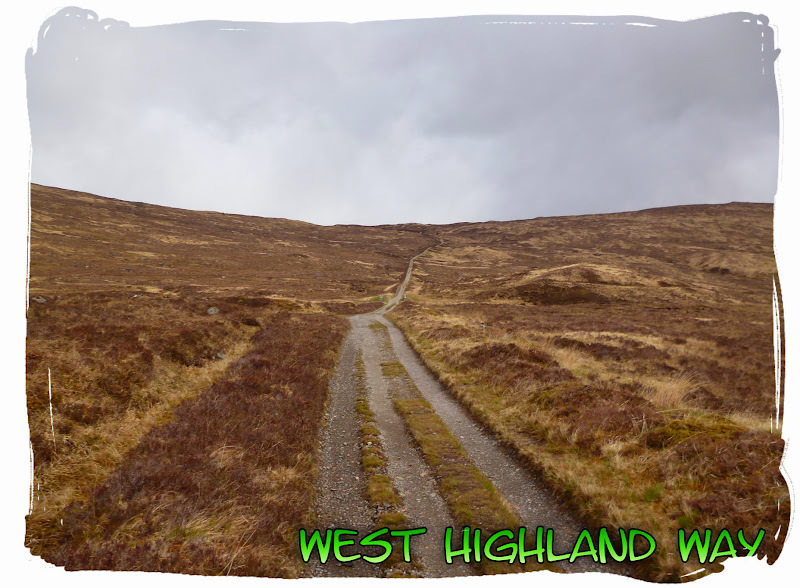 I quite fancy the Wicklow Way in Ireland though. 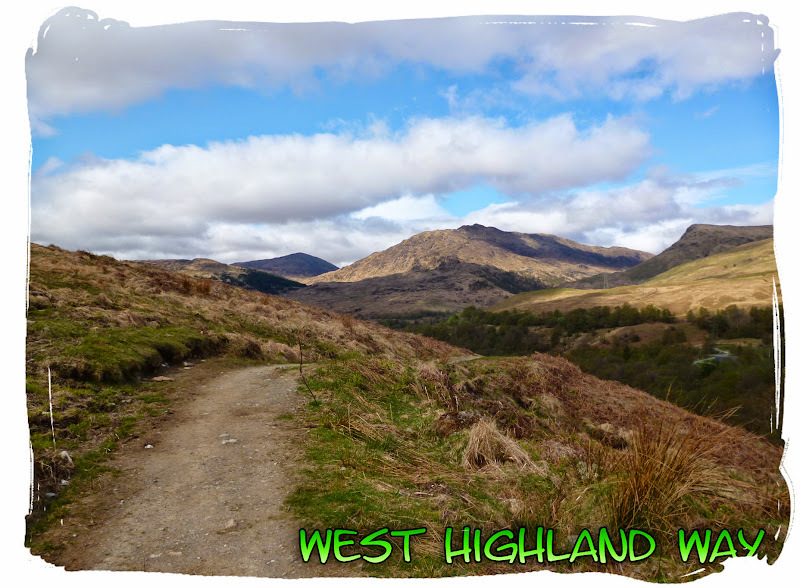 Never heard of the East Highland Way, just away to look that up. 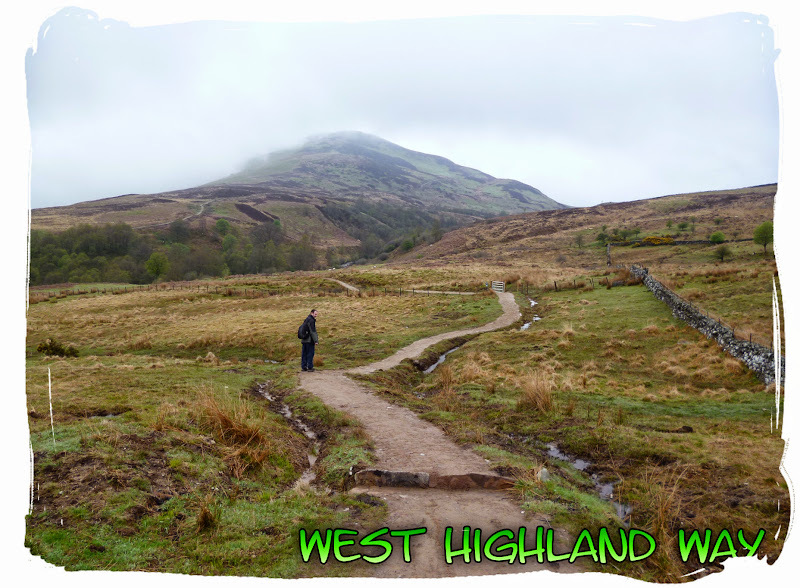 I like a bit of a challenge though, will have a map and compass and hopefully the weather will be slightly better in August, well certainly the temperature will be. The plan is to wild camp it, so it's just a matter of setting up camp whenever I get tired, also will have a tarp incase it rains and stove etc for cooking. Still looking for company though, I have one guy off here who is interested but hoping to find one or two more. 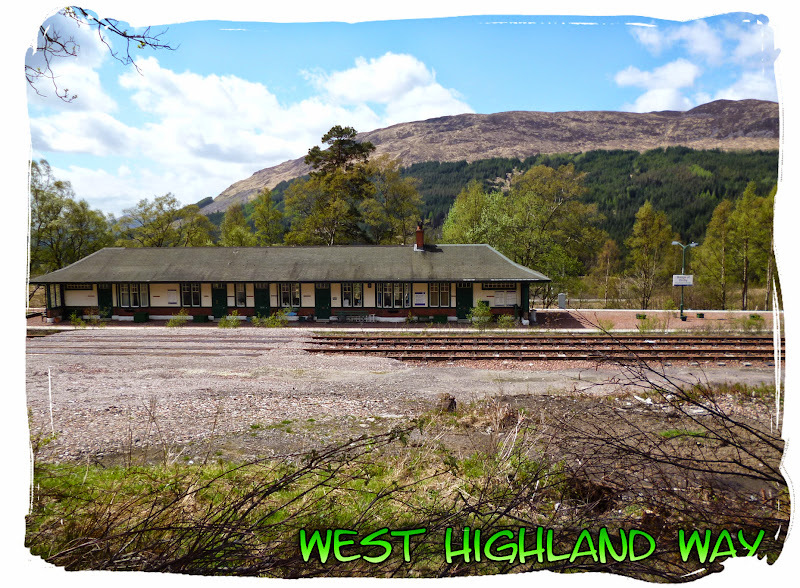 Should you change your mind about carrying your own kit on the EHW the man at Loch Ness Travel (George Simpson), who does the bag-carrying service for the Great Glen Way, provides the same service on the East Highland Way, and very good it is too! 24/02/15 - Have written up a fuller description and added more pics to the report. 02/03/15 - Edited some paragraphs and captions. Great pictures and summary of your journey. 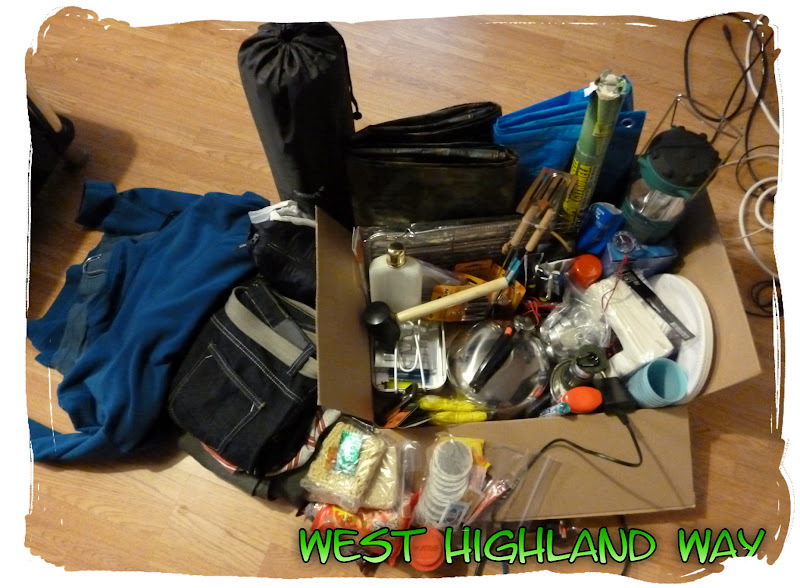 I'm doing the WHW this Friday over 4 night / 5 days. Getting quite nervous as I have heard of many people doing it over 5 days. I'm also carry my baggage which will probably make it a little more challenging. 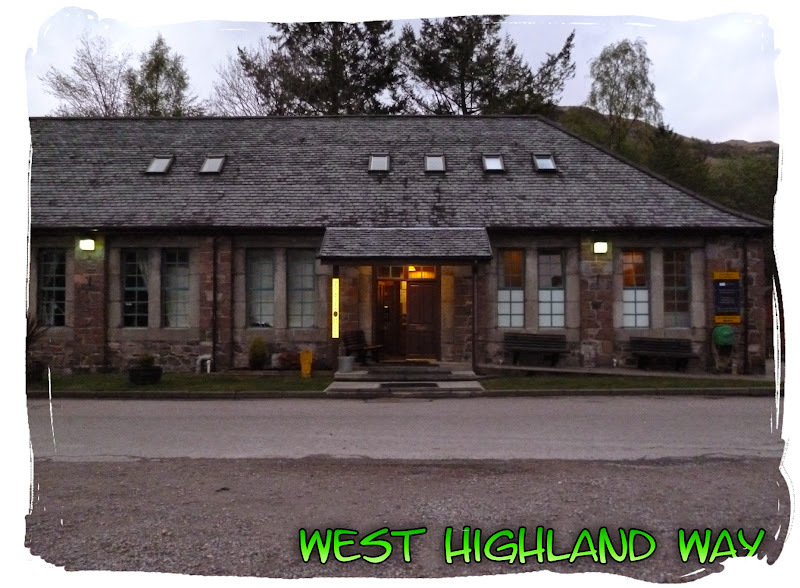 We're using B+B accommodation but so hopefully a good place to sleep at night will help. Has anyone else done It over 5 days? I did it over 6 days,,pretty early on in my walking /climbing career,,and I can say,,would have preferred 5,, 3 very "short" days could easily have been split into 2 average ones. Wasn't carrying all my kit right enough but had day pack etc,,I really don't think it would have made much difference but I had great weather so clothes dry etc. Best of luck and most of all, enjoy! It really just depends how many miles your legs and feet can manage in a day. I know from experience that I can manage about 22 miles in a day but that's too much if you want to take some time out to just sit back and enjoy the scenery aswell. 17-19 miles a day is more comfortable though, which is pretty much what you'll be covering per day, as long as you have strong legs and not prone to blisters you'll be fine. 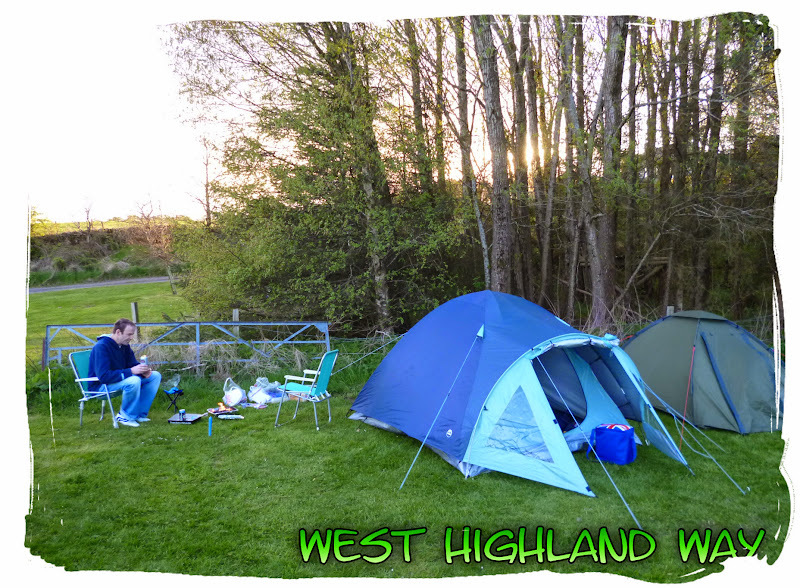 I'm thinking of doing this again myself, over 5 days, early May, I'll be camping though. B&B accommodation will certainly be more comfortable for you at the end of a tiring day. Enjoy.